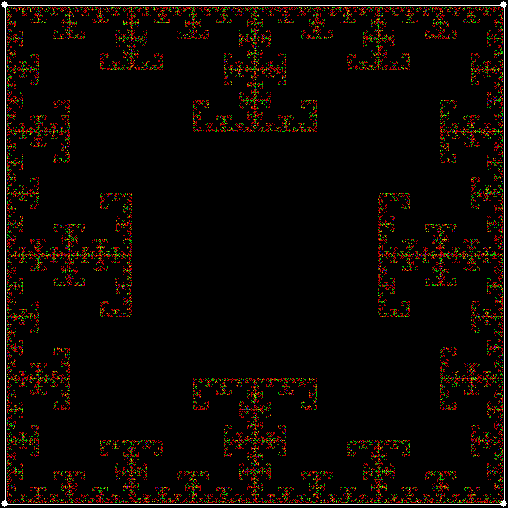 It’s easy to think of variants on all these themes, but I’ll leave them as an exercise for the interested reader. 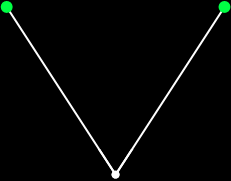 But you can swing the point while applying a vertex-ban, like banning the previously chosen vertex, or the vertex 90° or 180° away. 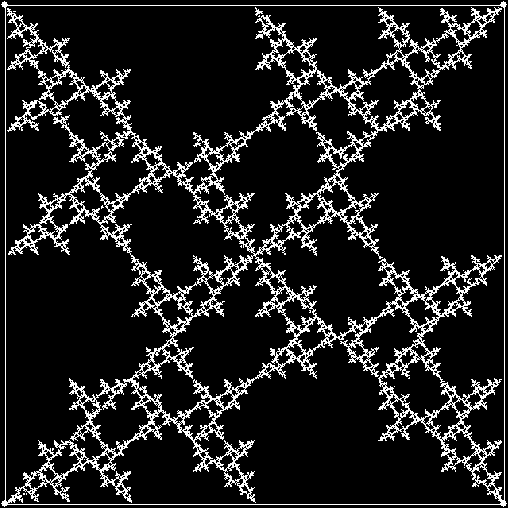 In fact, swinging the points converts one kind of vertex ban into the others. 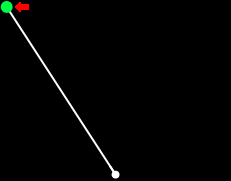 You can also reverse the swing at every second move, swing the point around a vertex instead of the center or around a point on the circle that encloses the square. Here are some of the fractals you get applying these techniques. 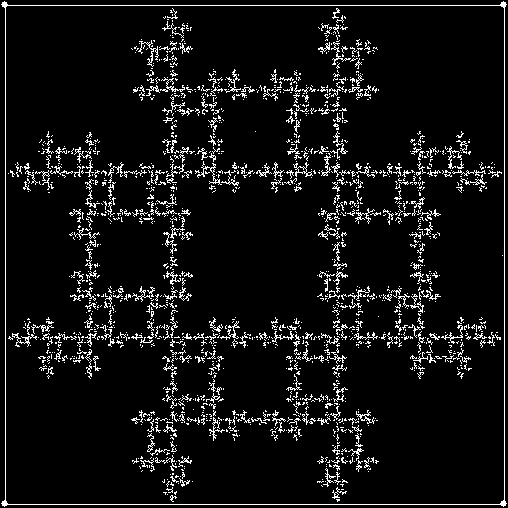 Reflection is how you find the hourglass fractal. 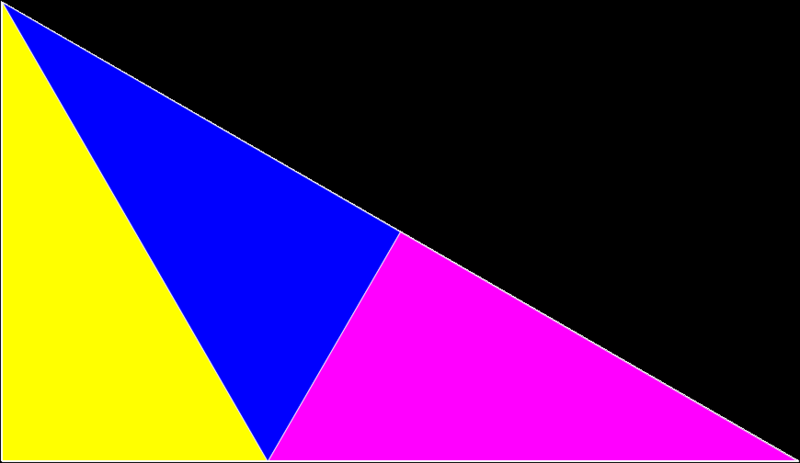 First, divide a right triangle into four smaller right triangles. 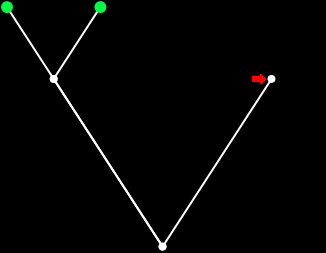 Maths is a mountain: you can start climbing in different places and reach the same destination. 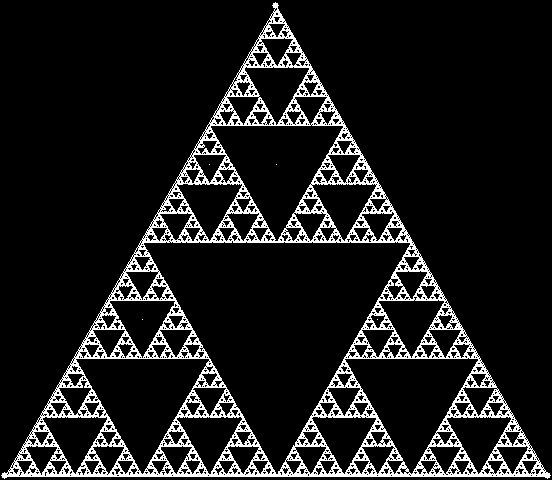 There are many ways of proving the irrationality of √2 or the infinitude of the primes, for example. 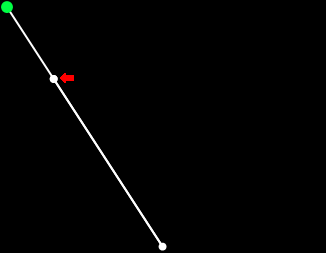 But you can also arrive at the same destination by accident. 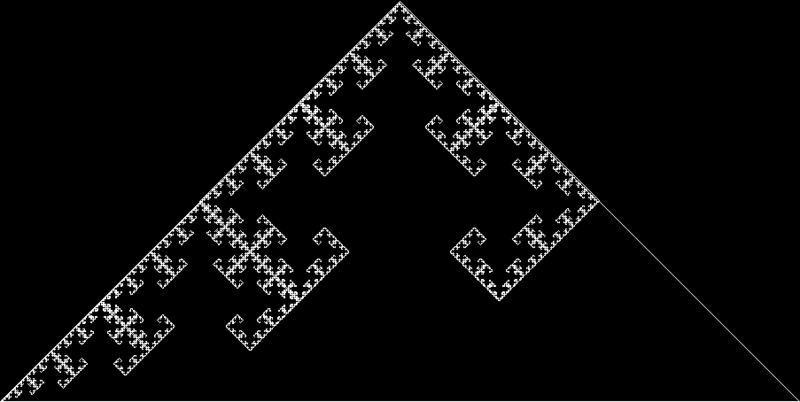 I’ve found that when I use different methods of creating fractals. 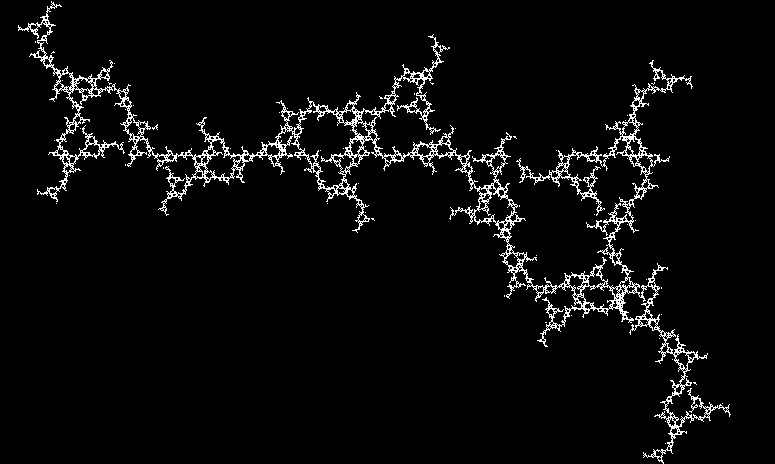 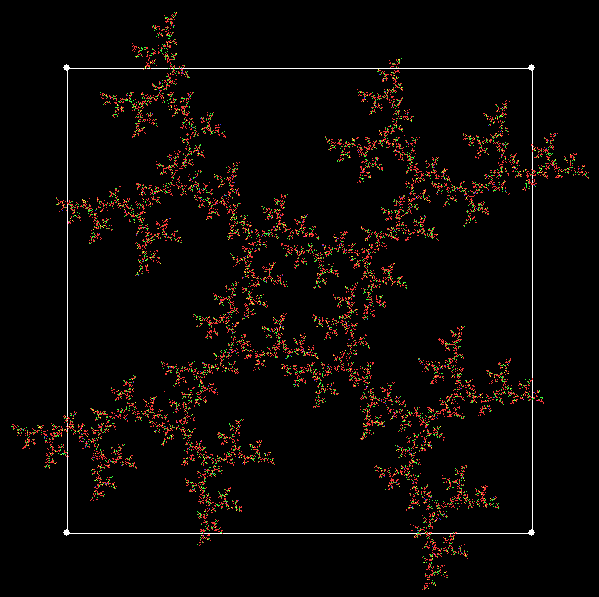 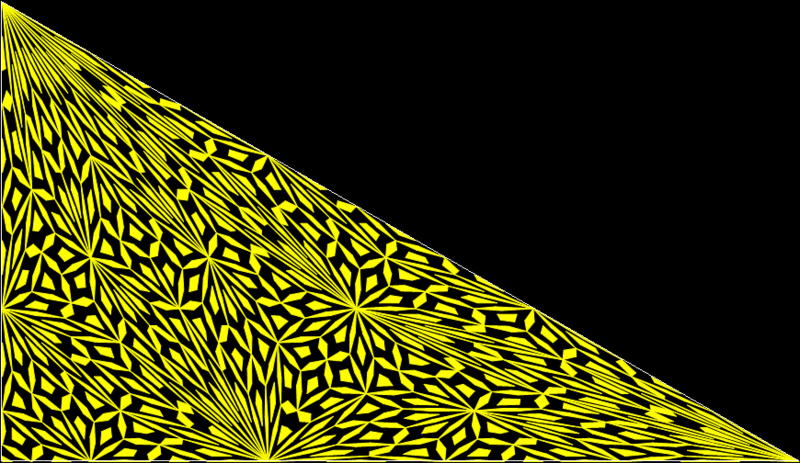 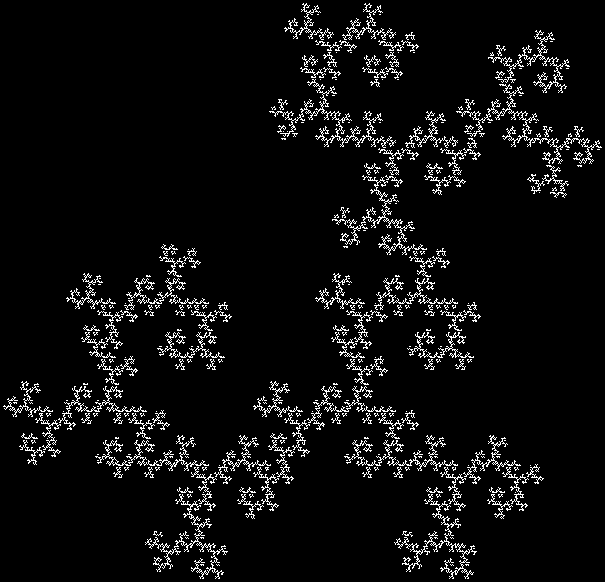 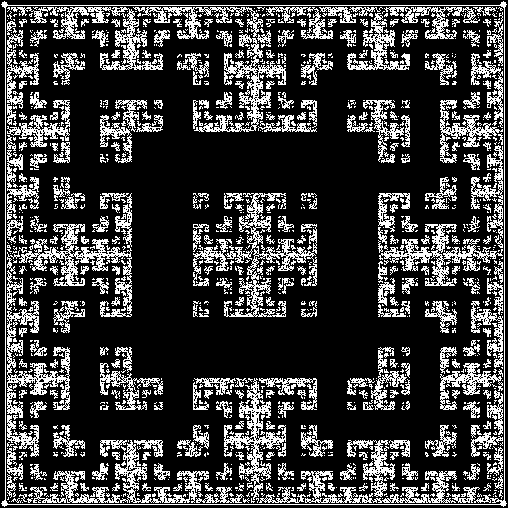 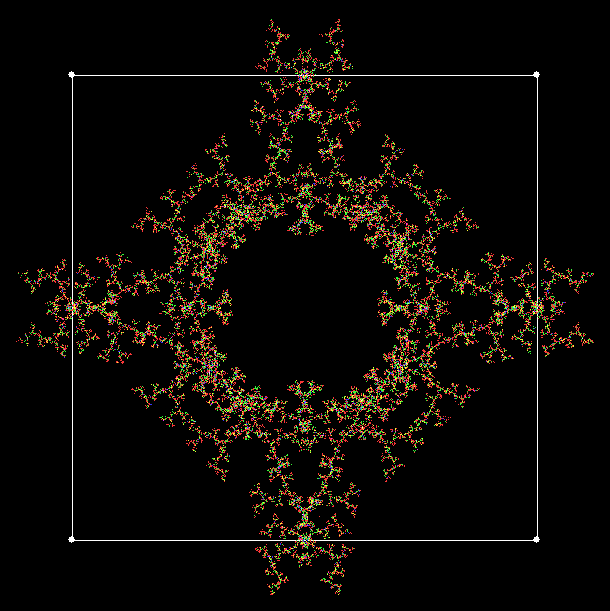 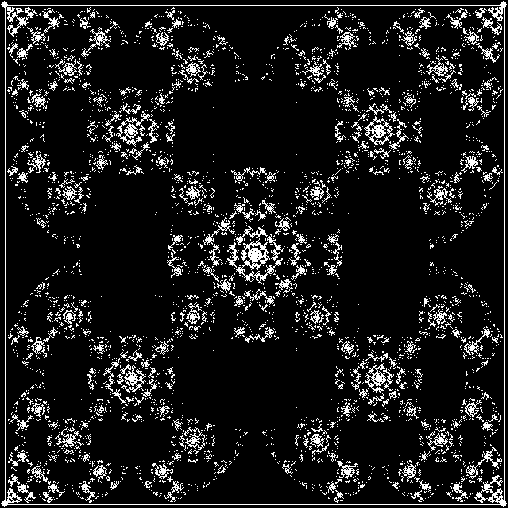 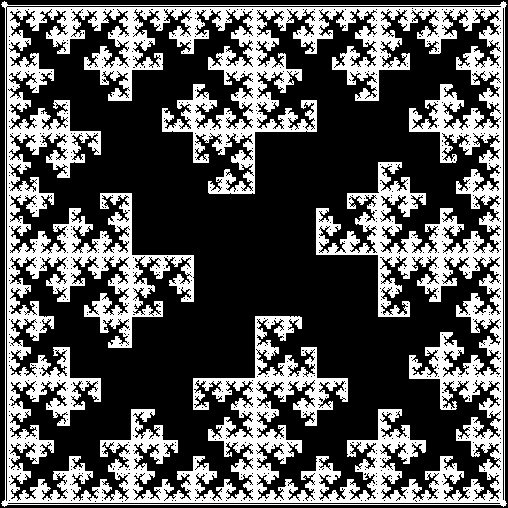 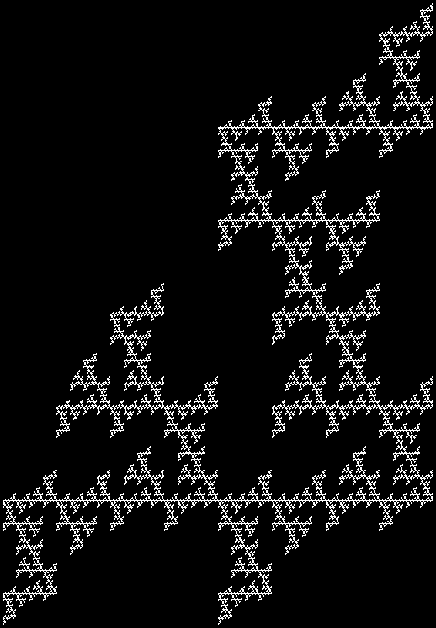 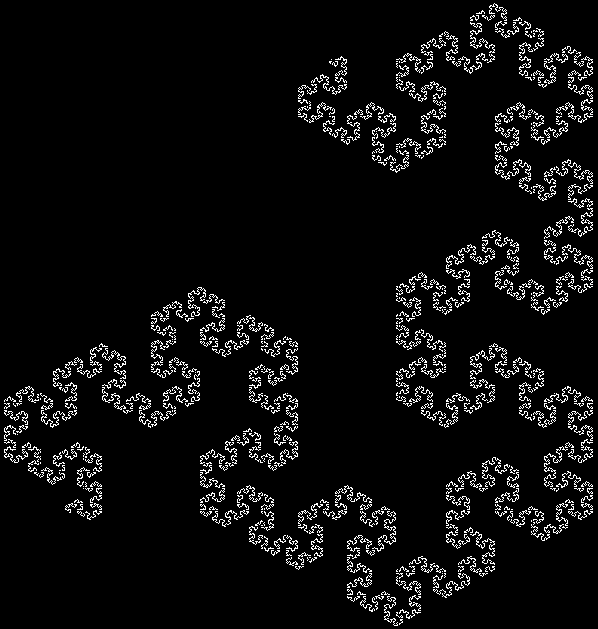 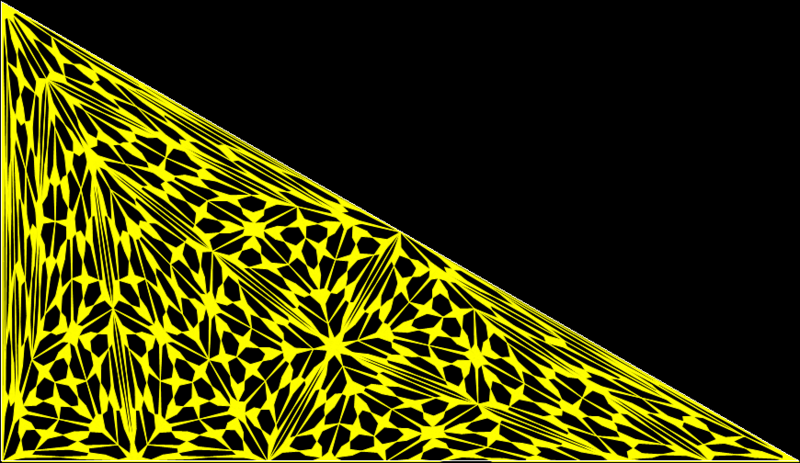 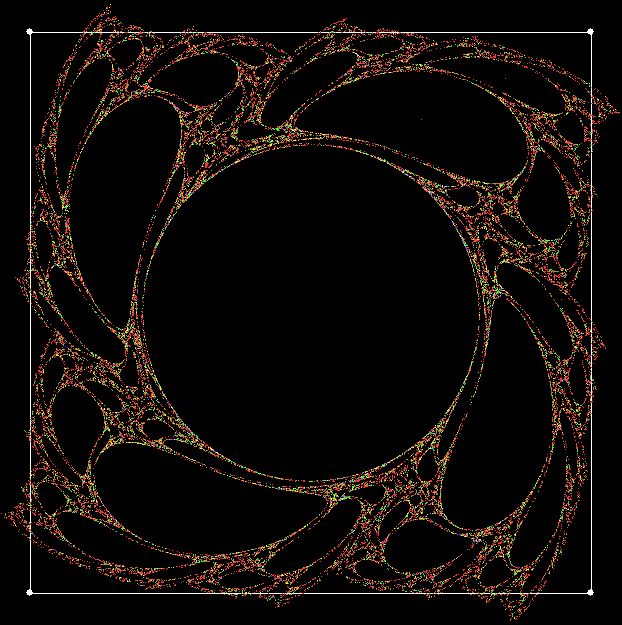 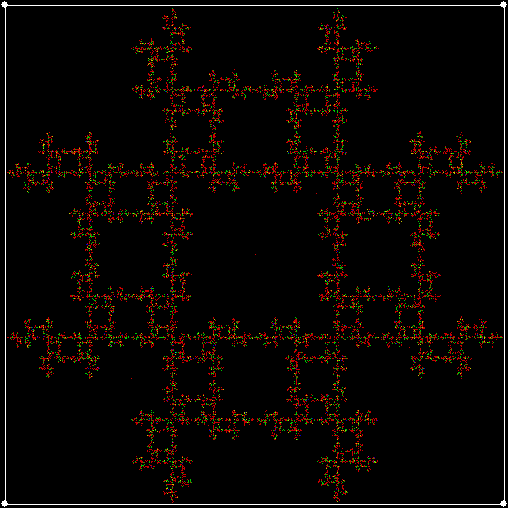 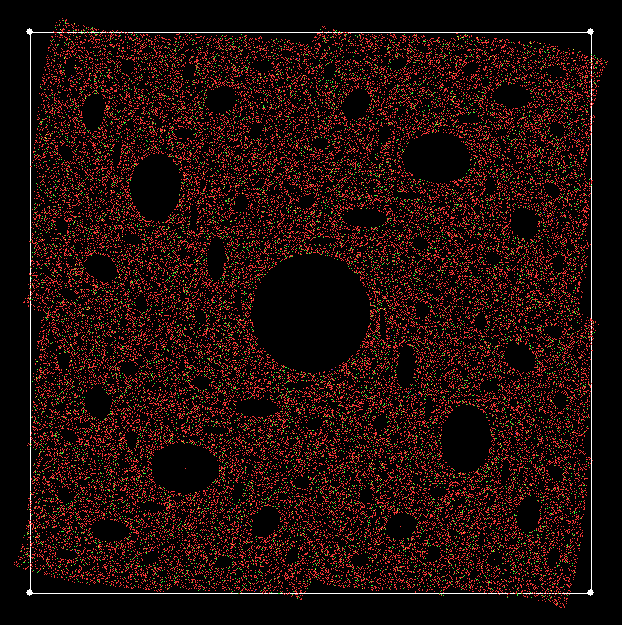 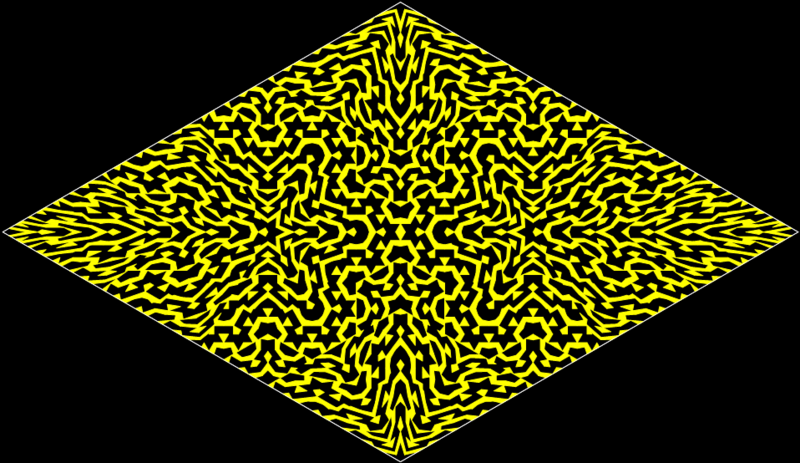 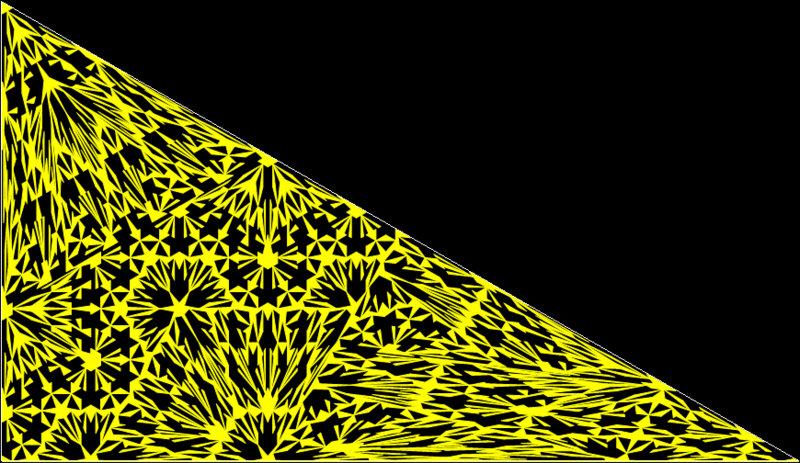 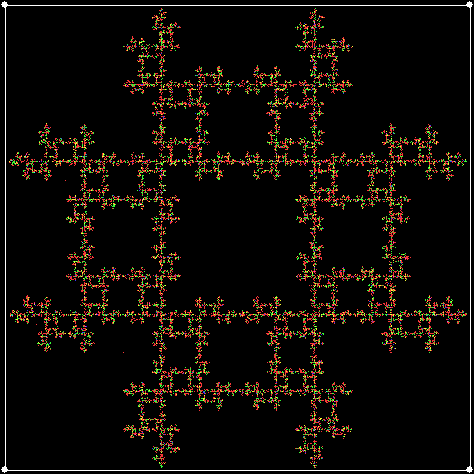 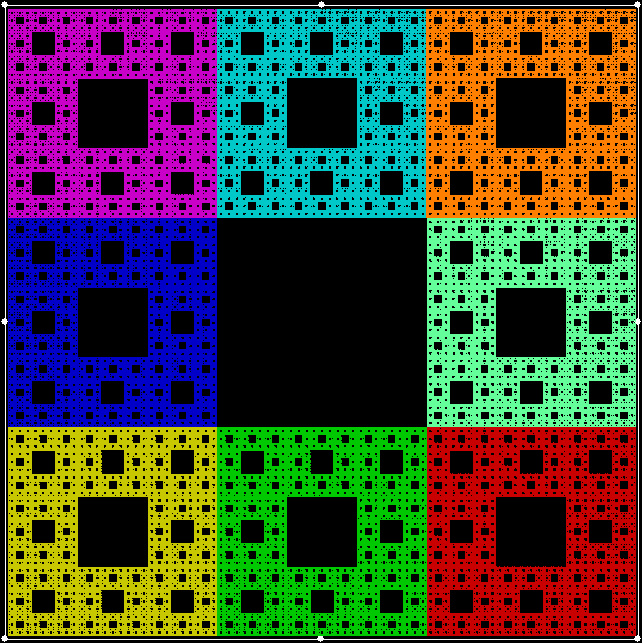 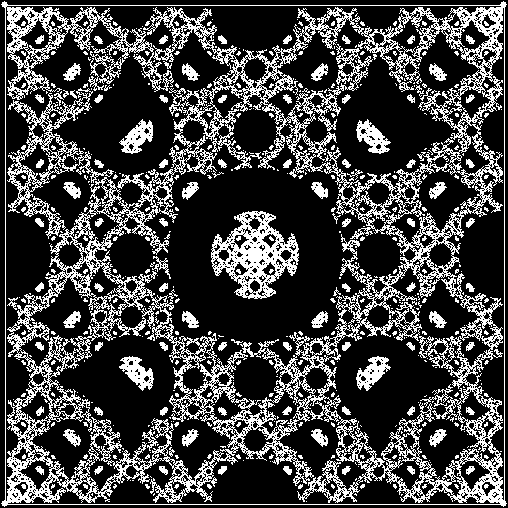 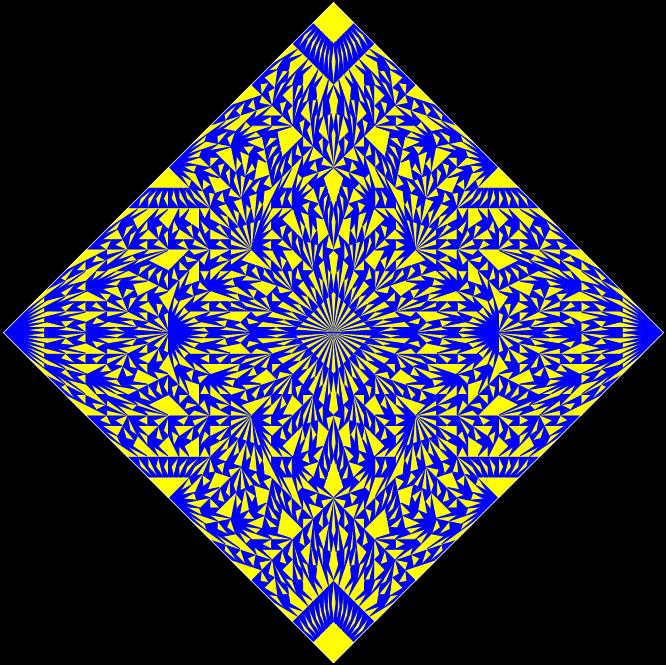 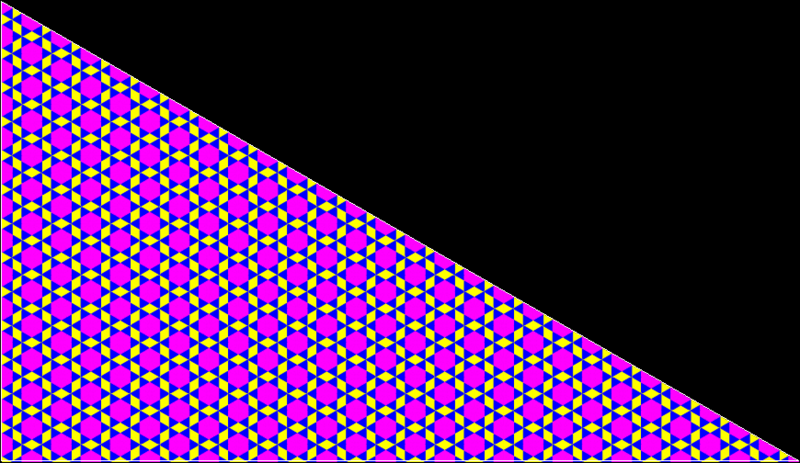 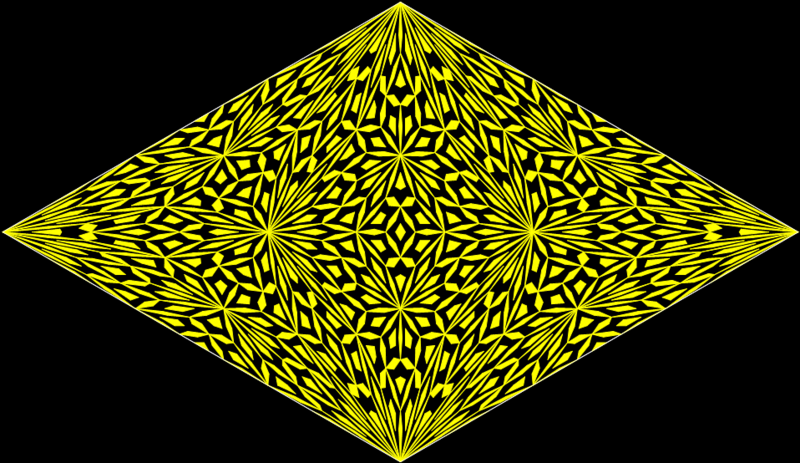 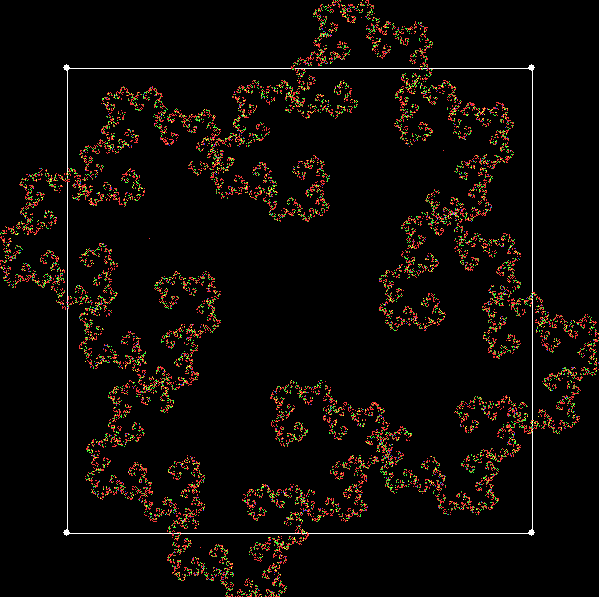 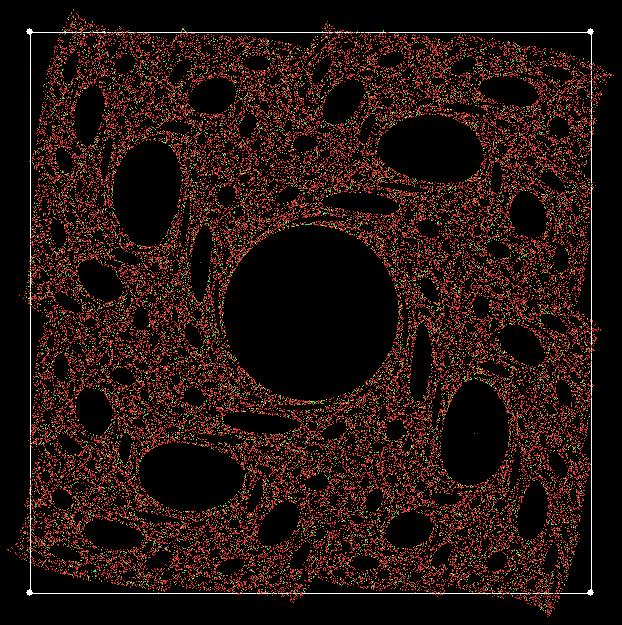 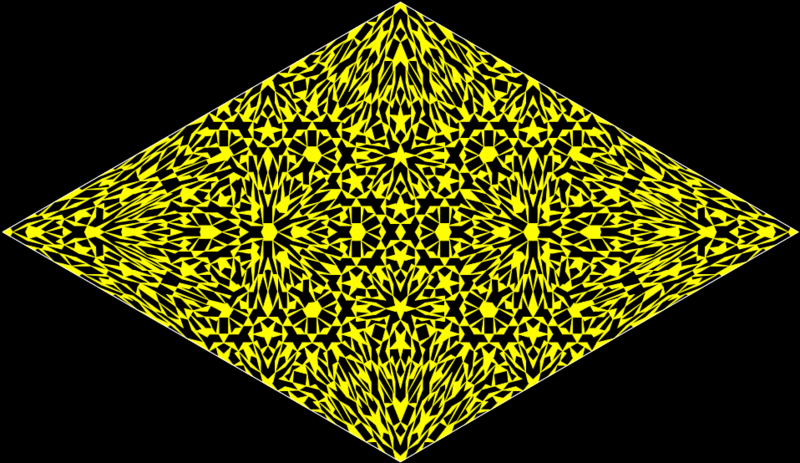 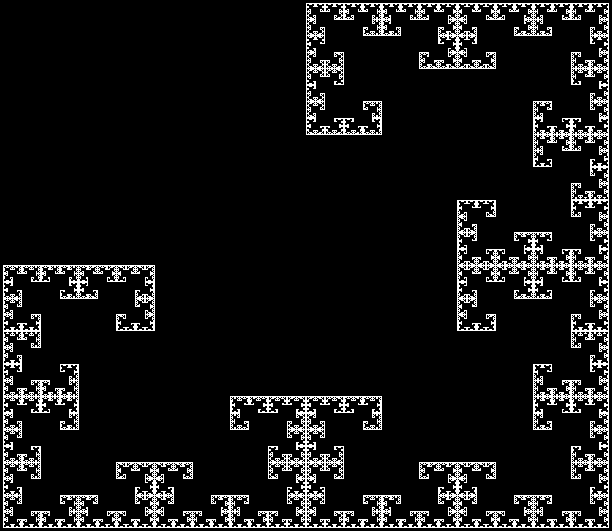 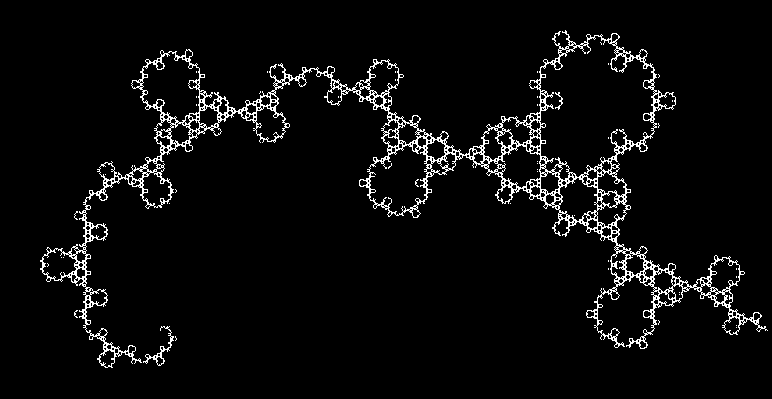 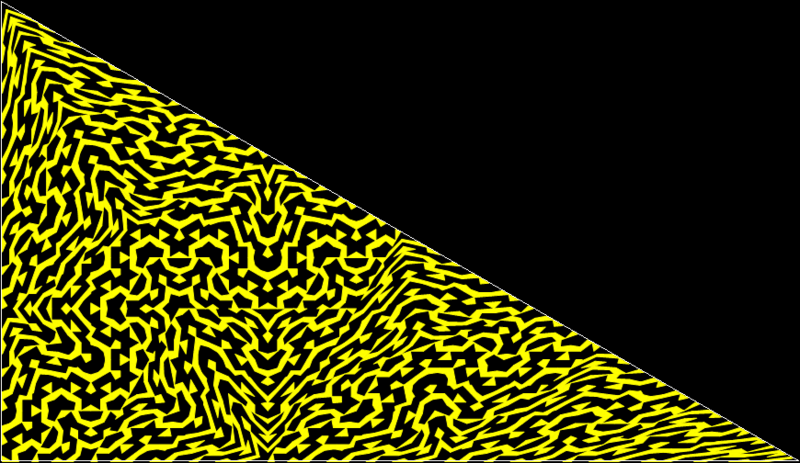 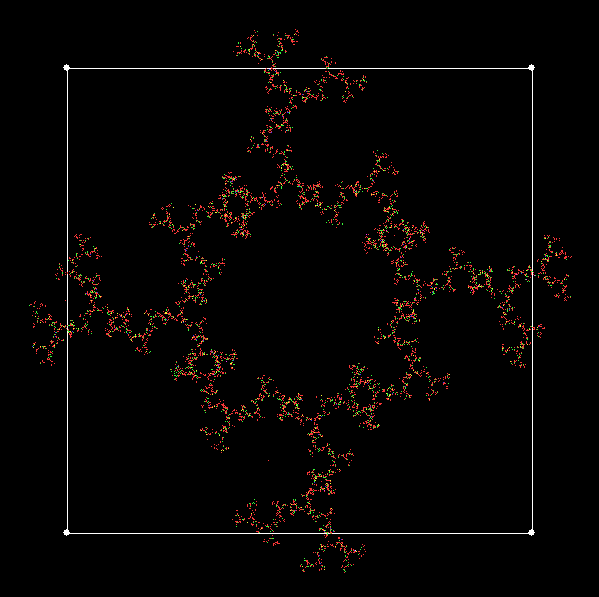 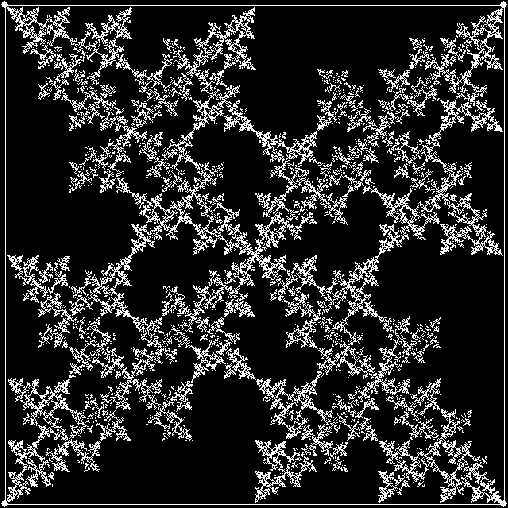 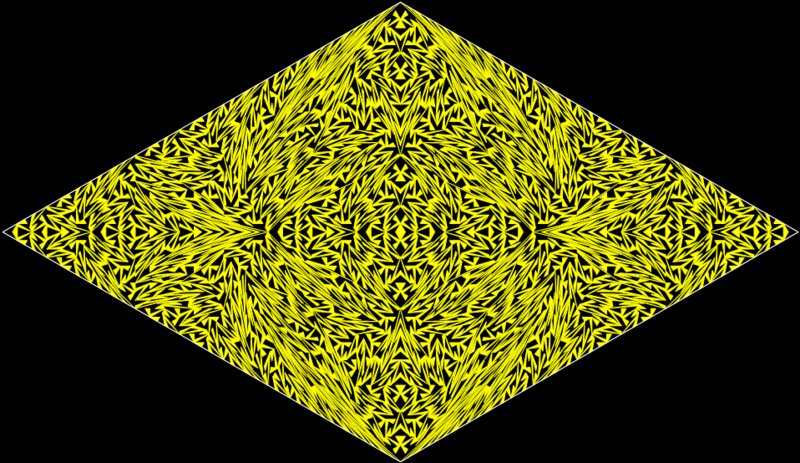 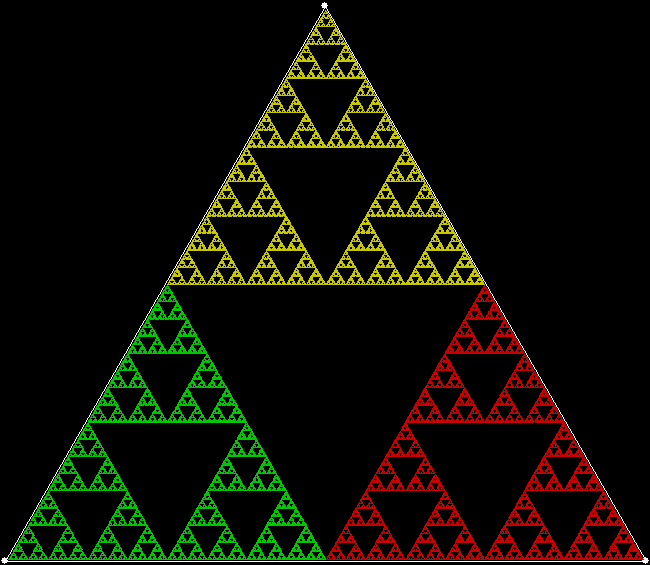 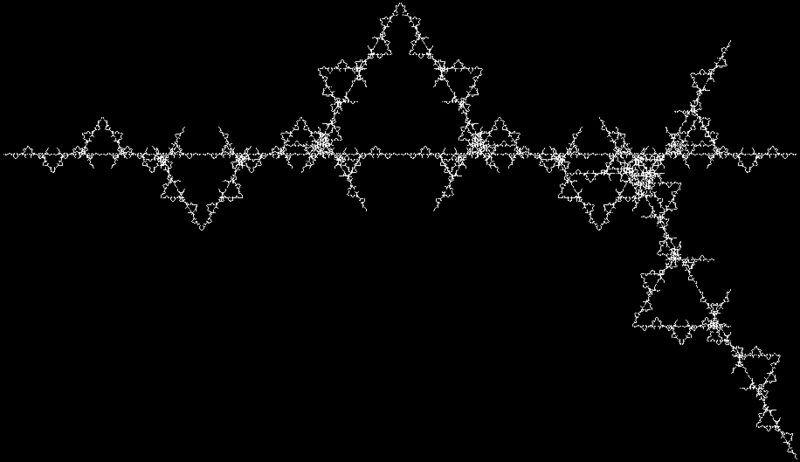 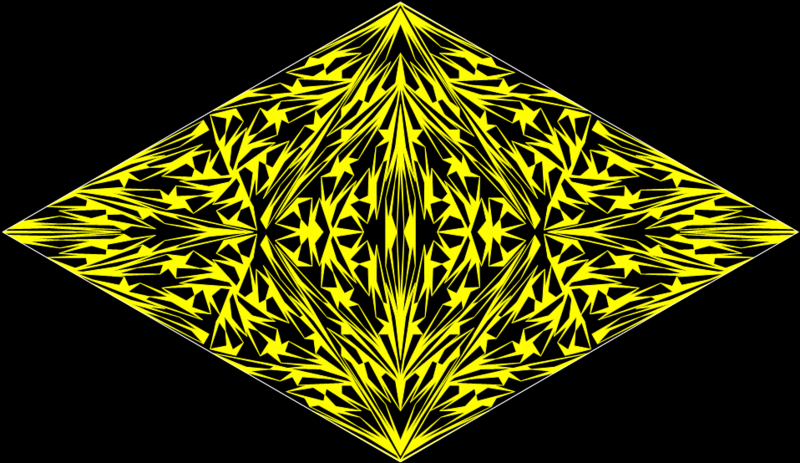 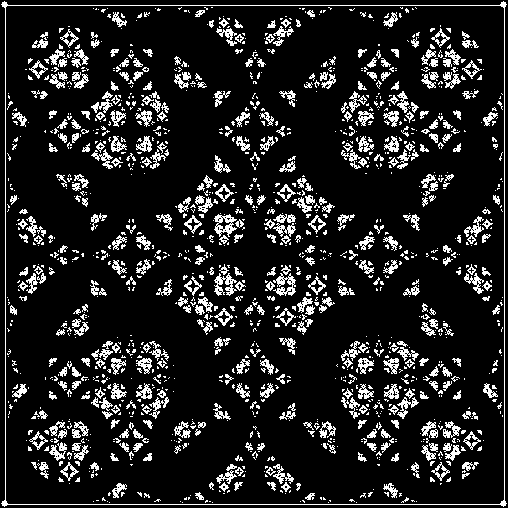 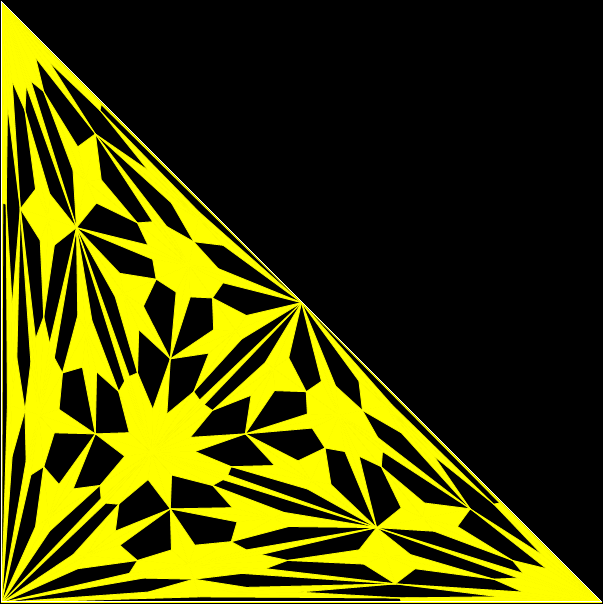 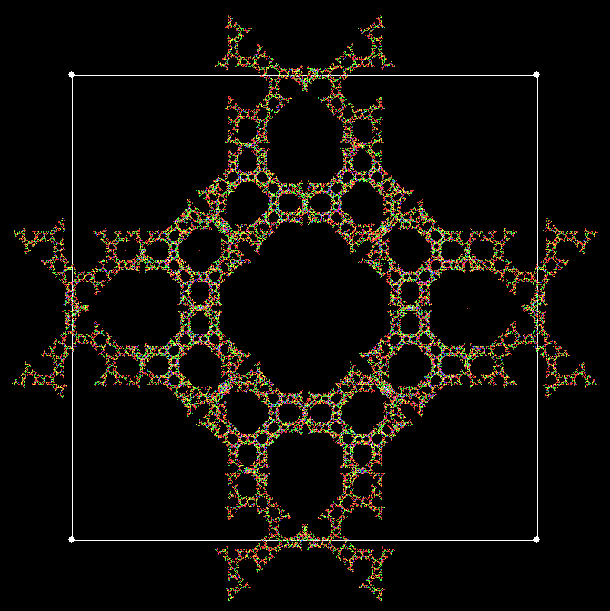 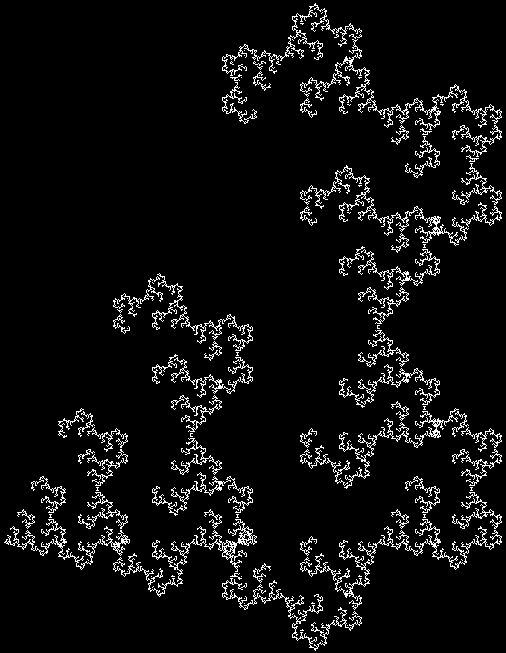 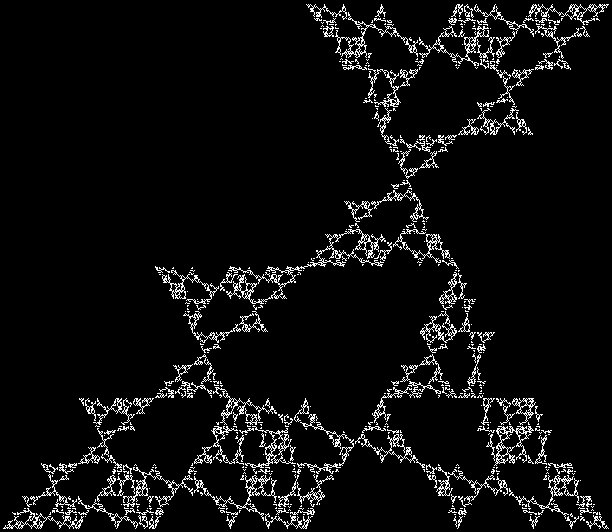 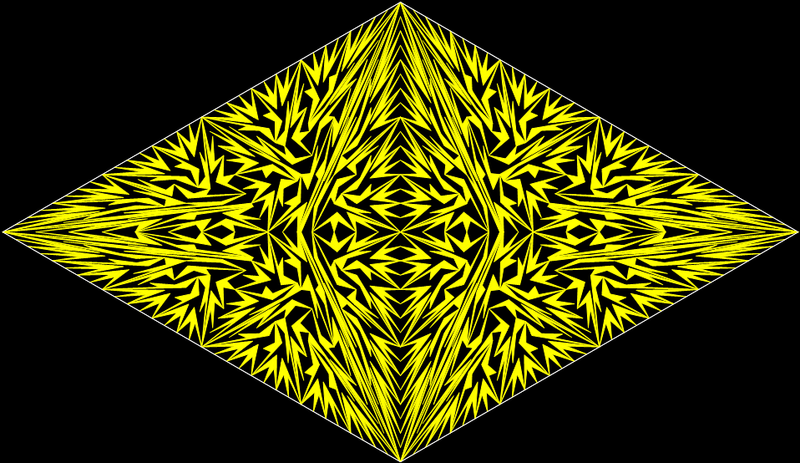 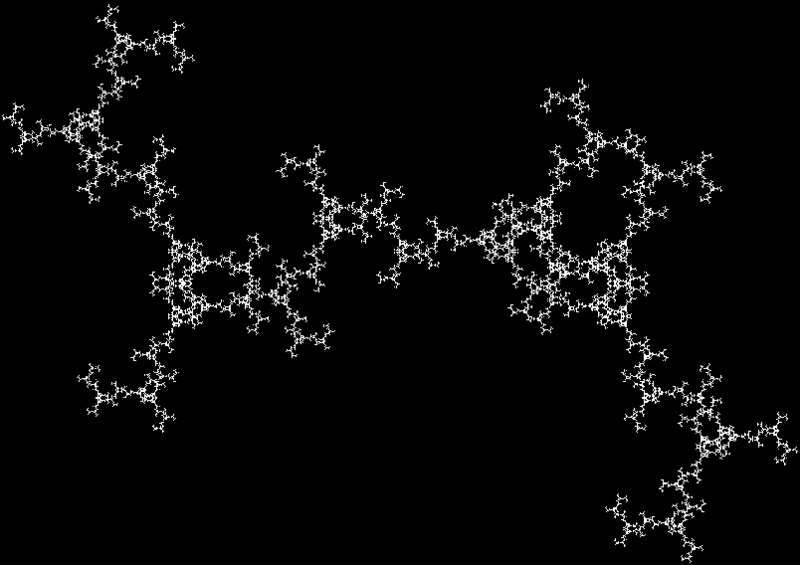 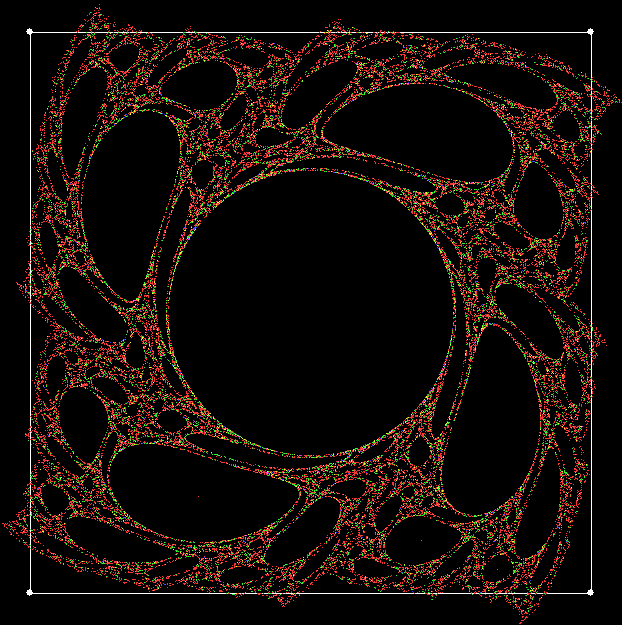 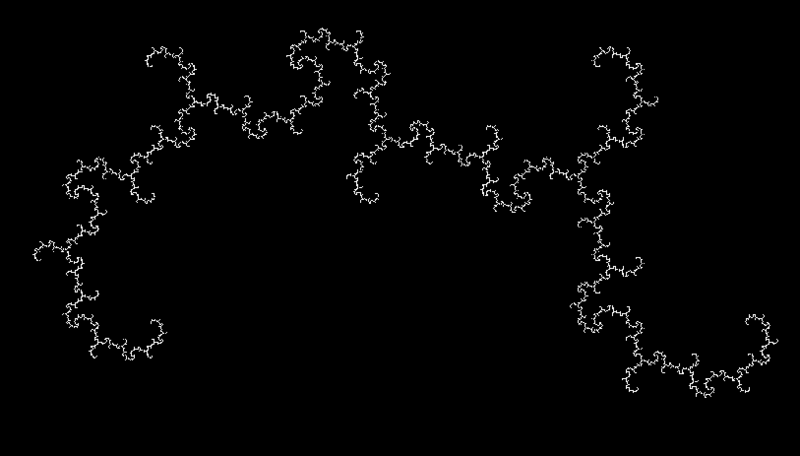 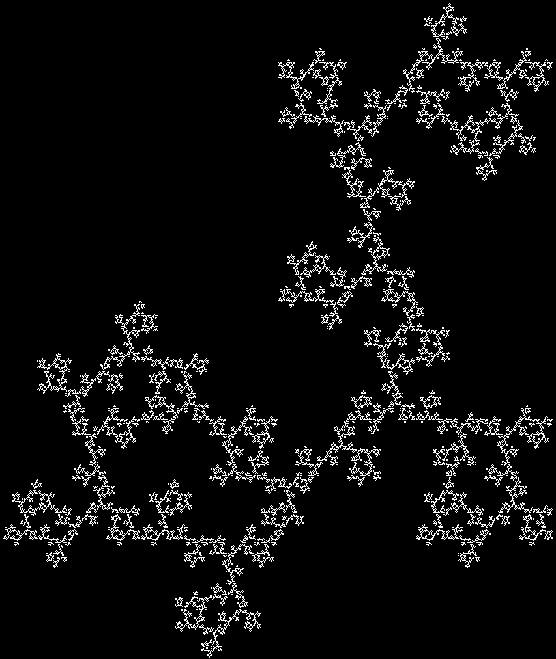 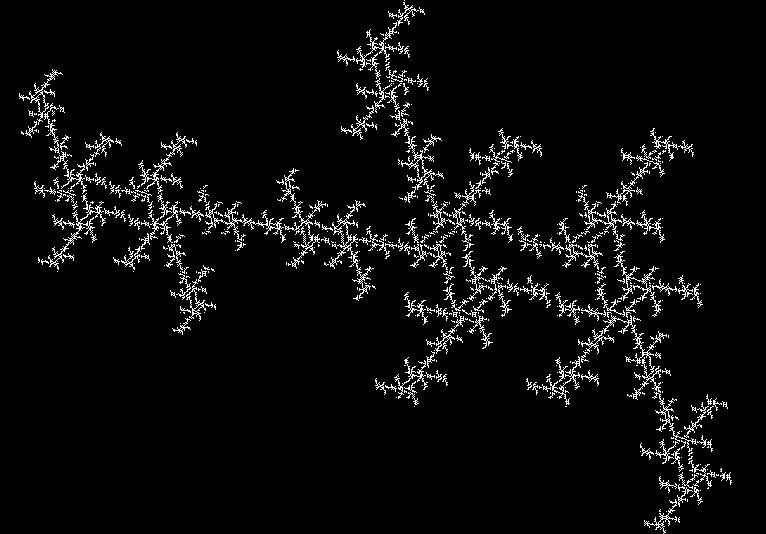 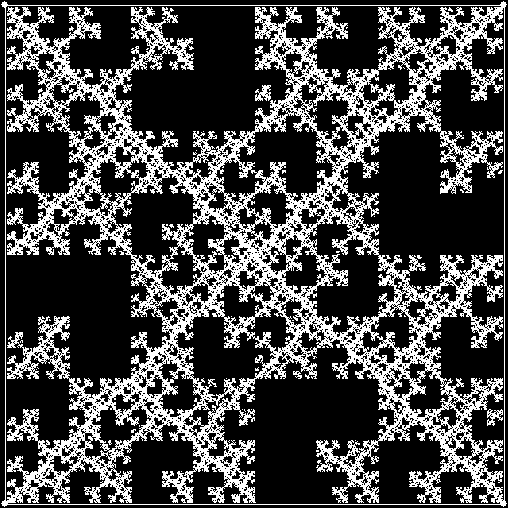 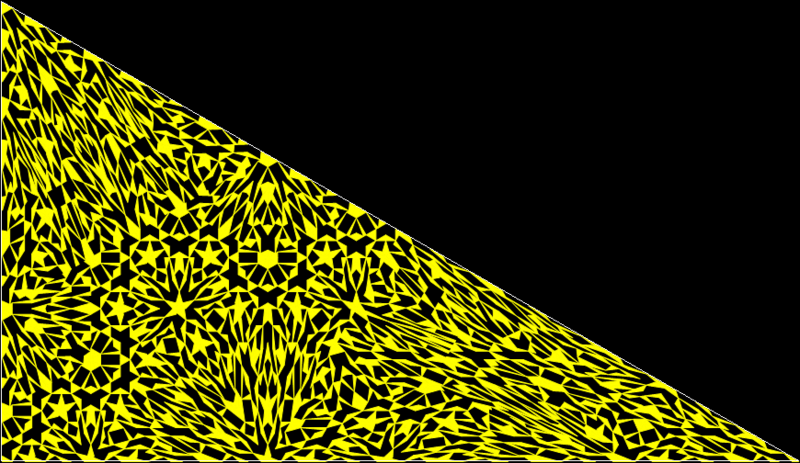 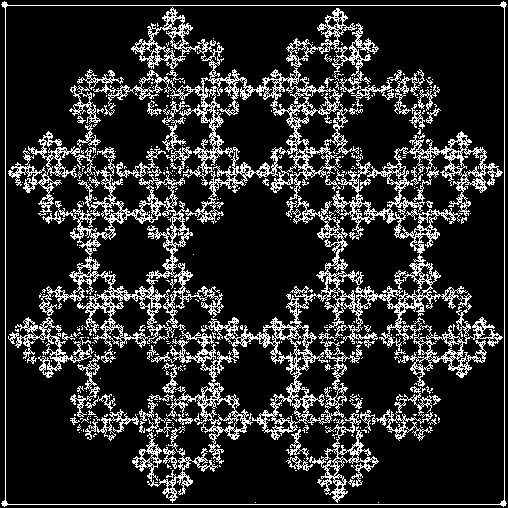 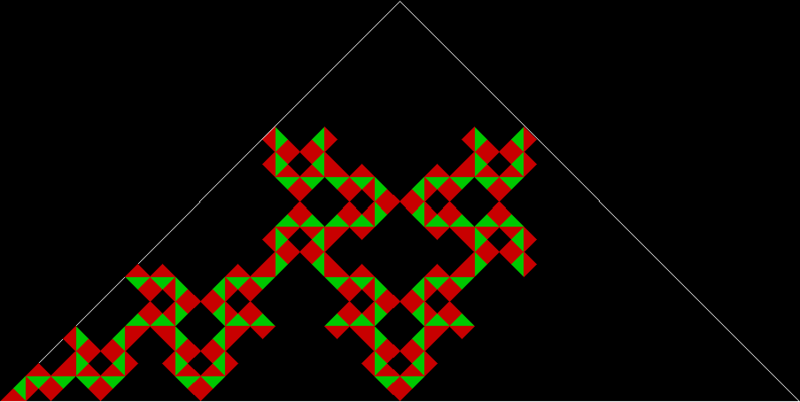 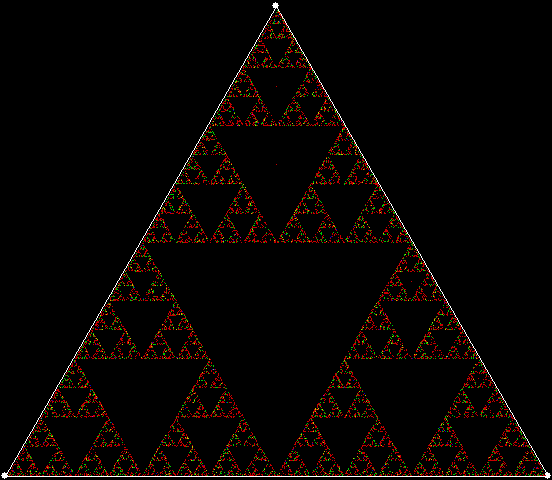 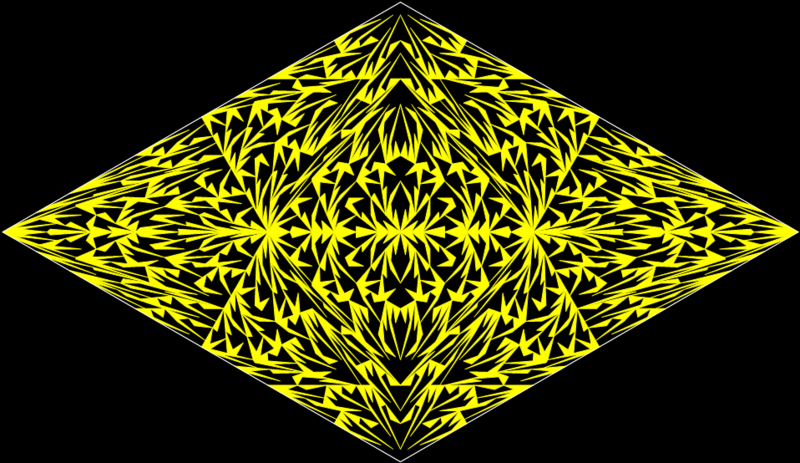 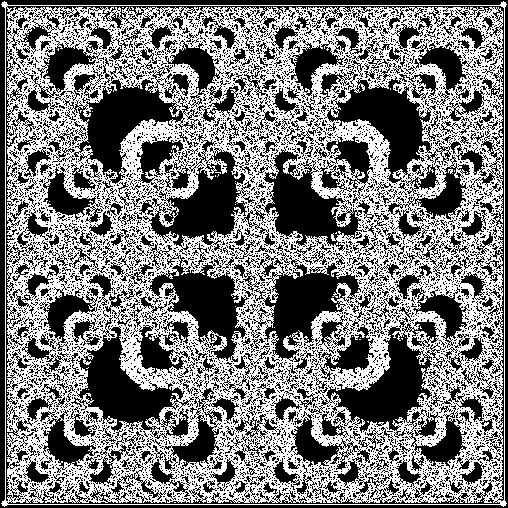 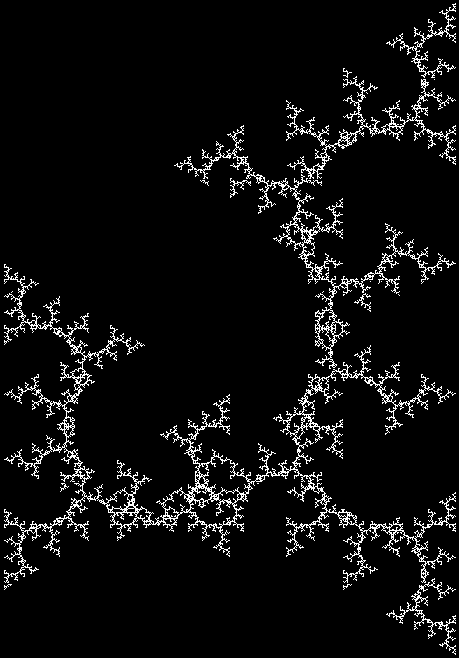 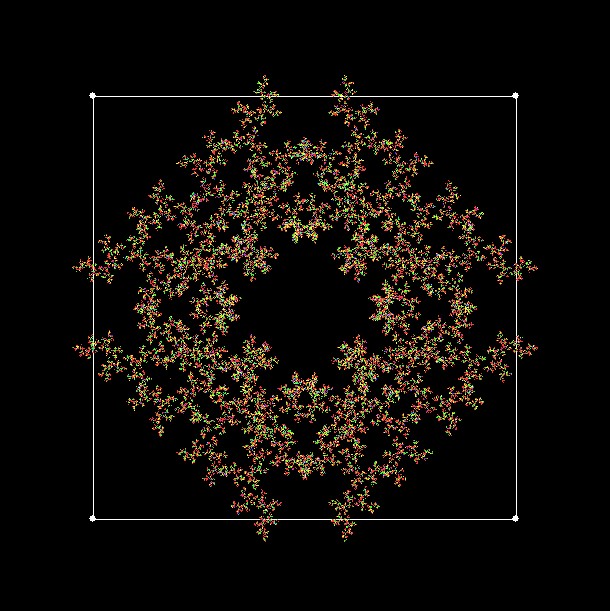 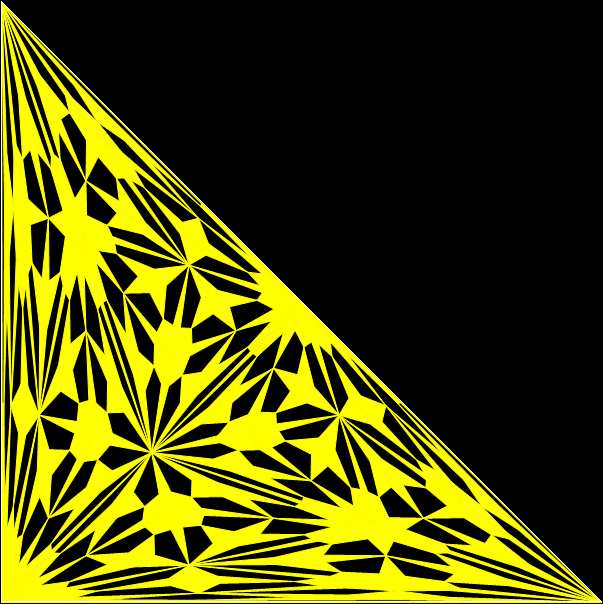 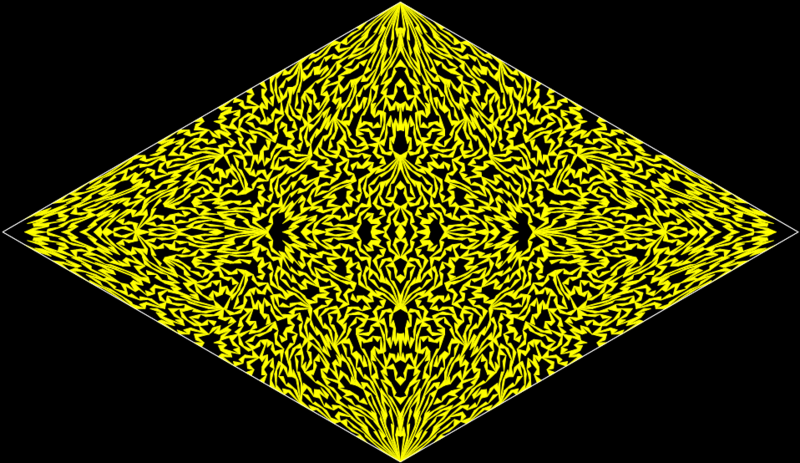 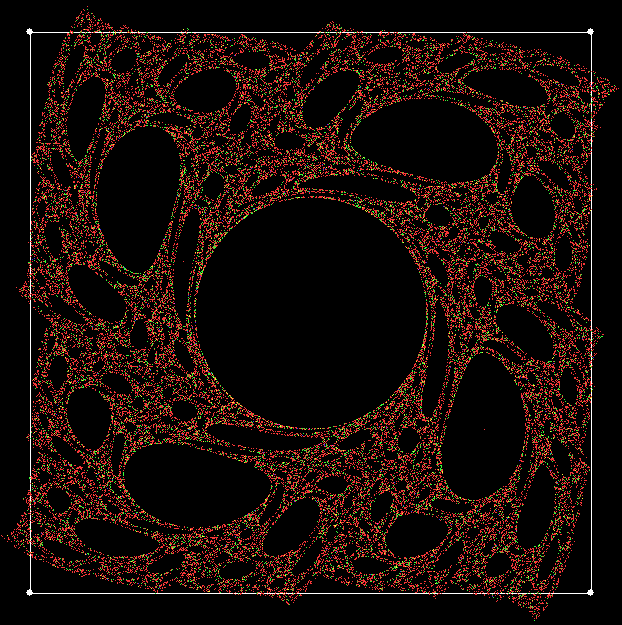 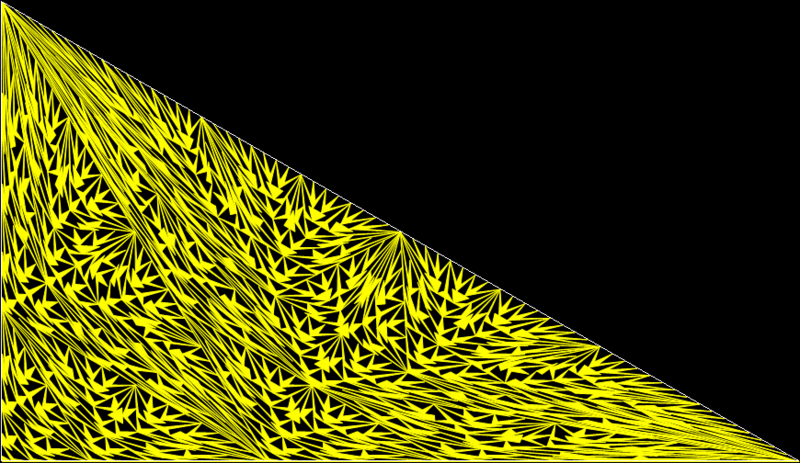 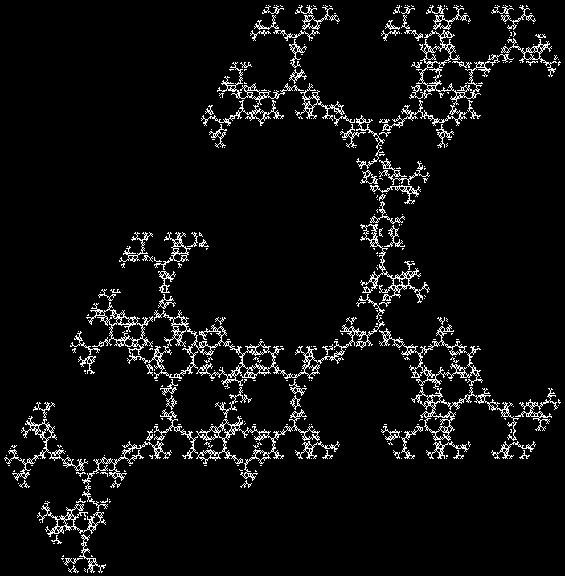 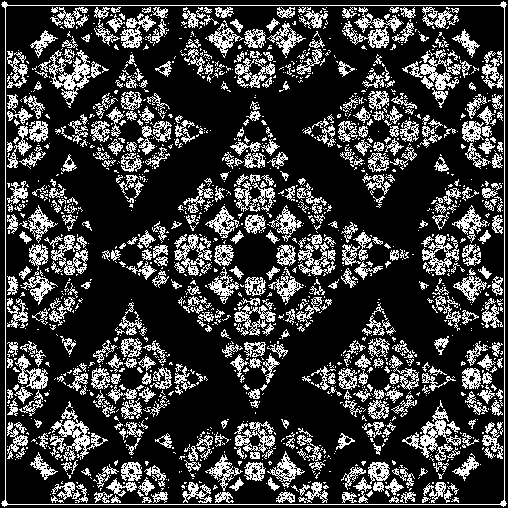 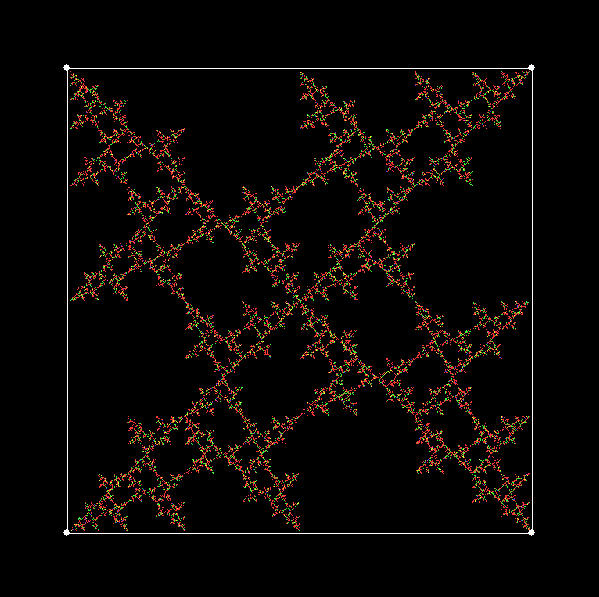 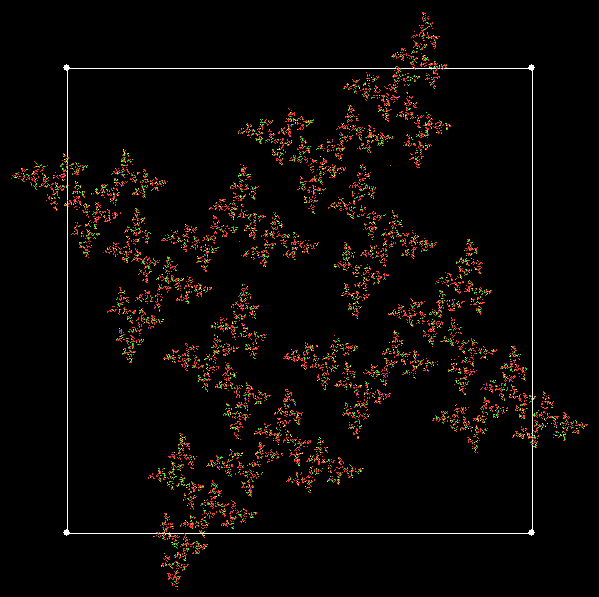 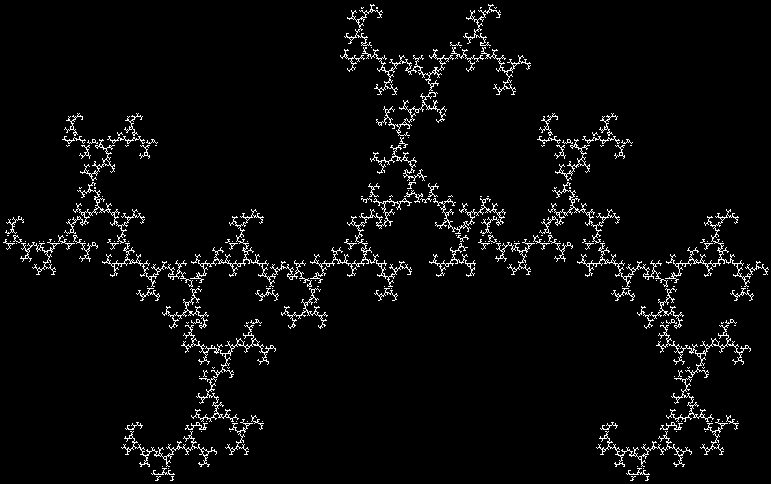 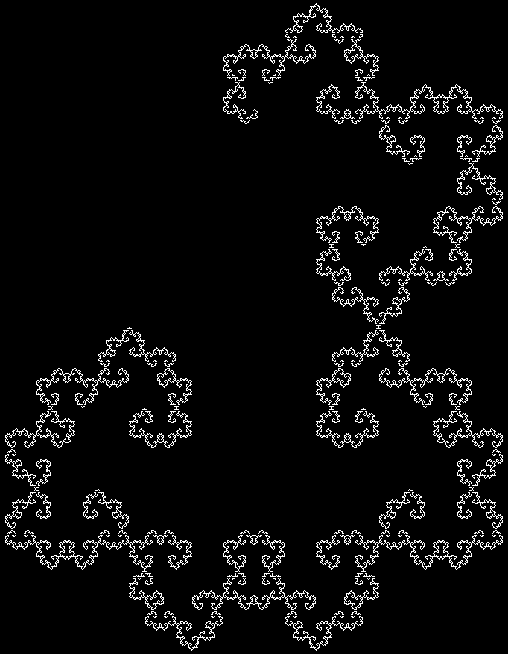 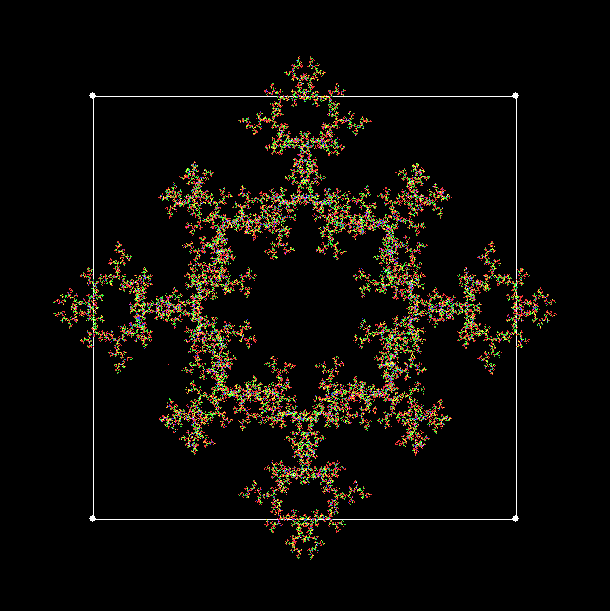 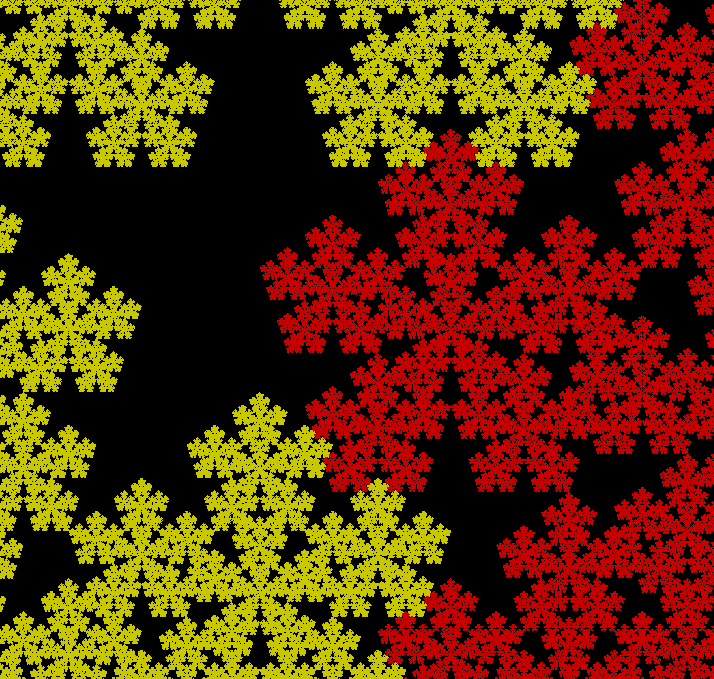 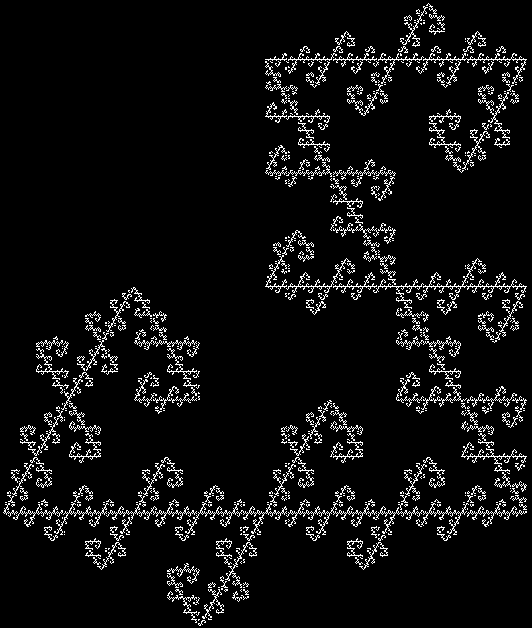 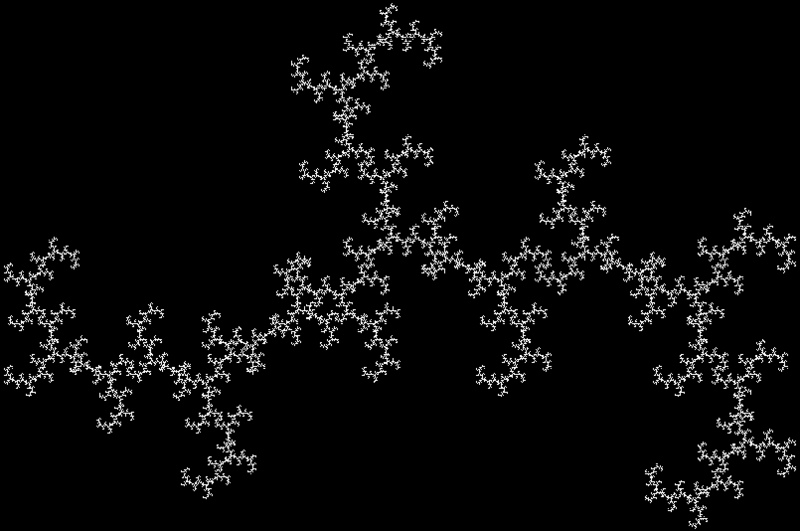 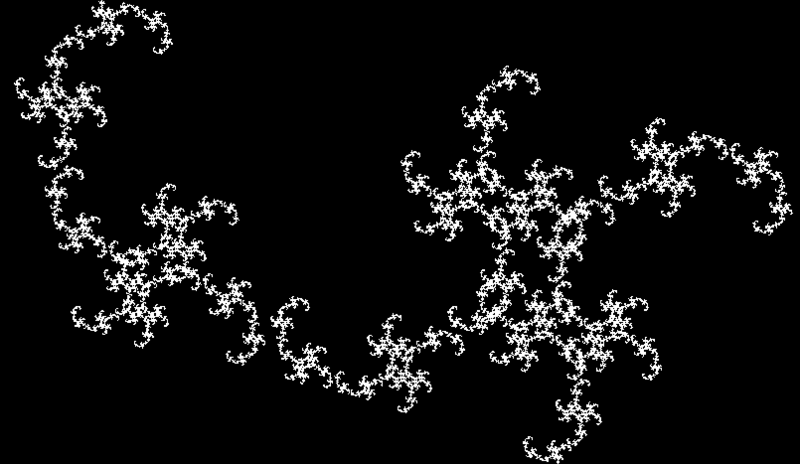 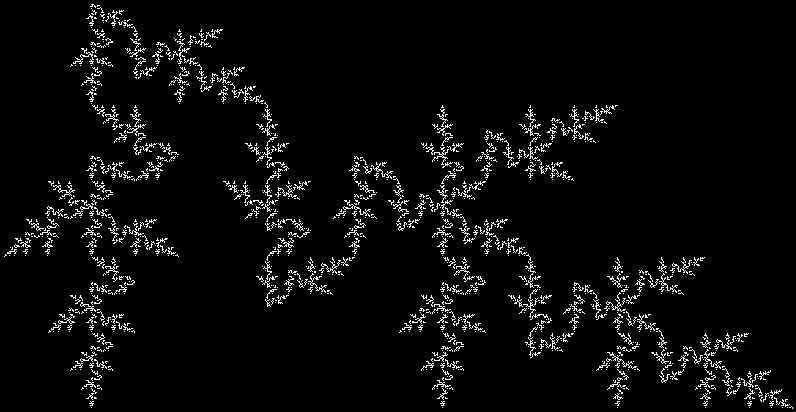 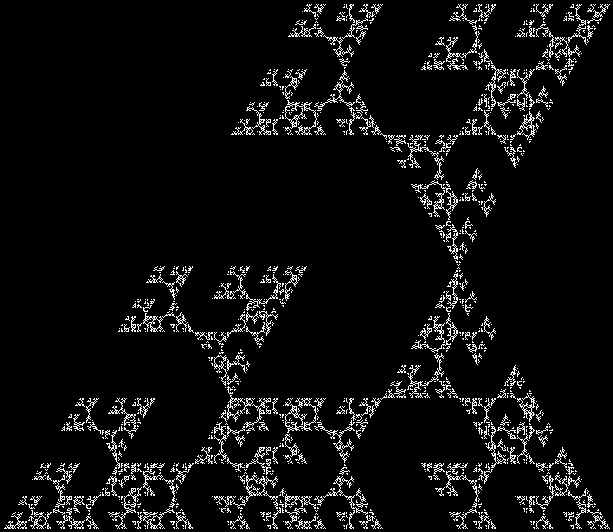 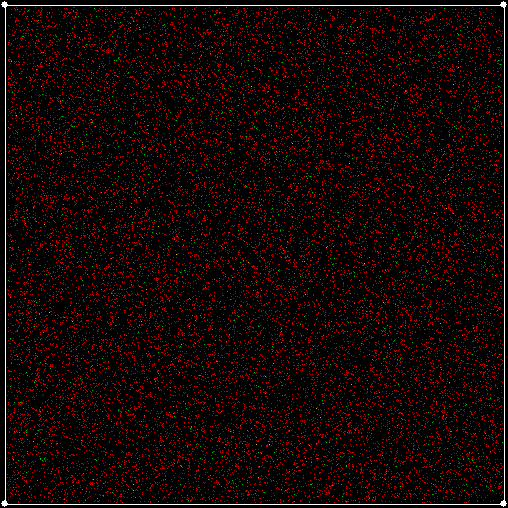 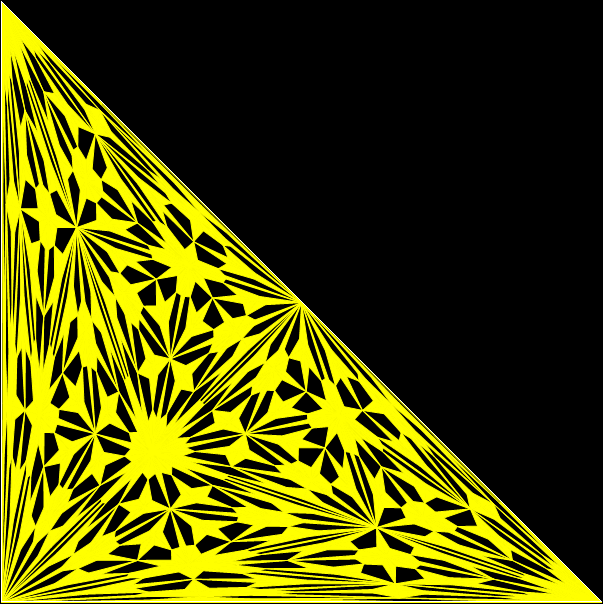 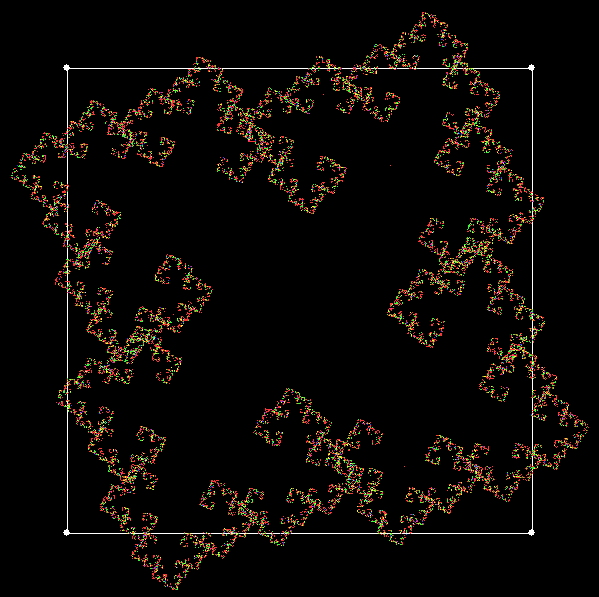 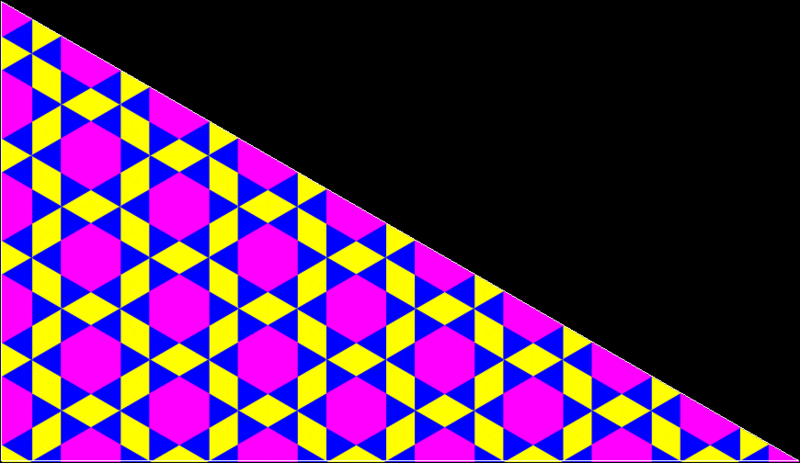 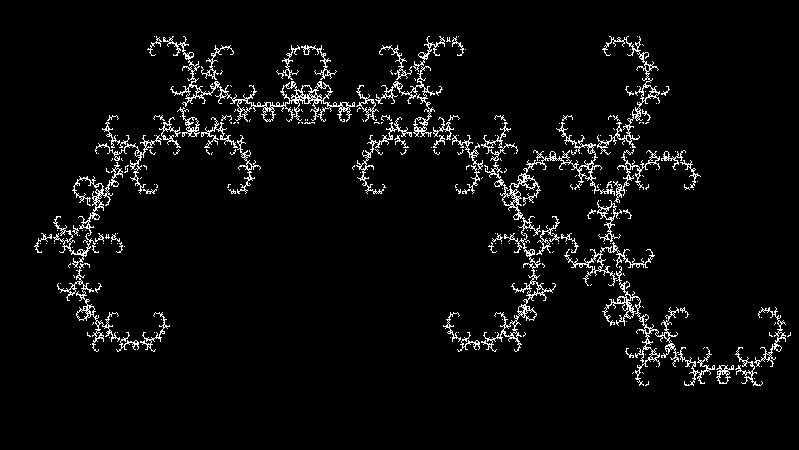 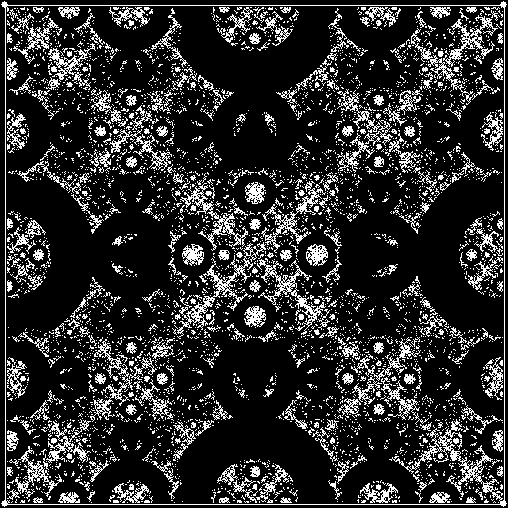 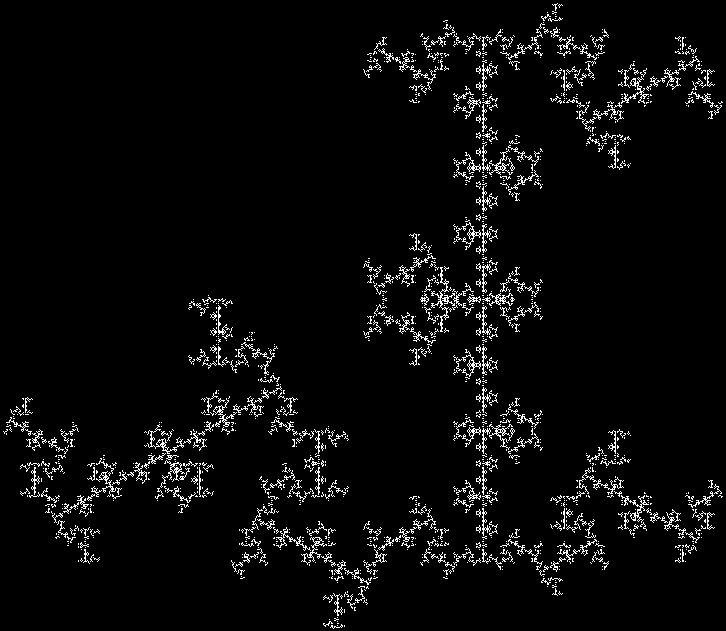 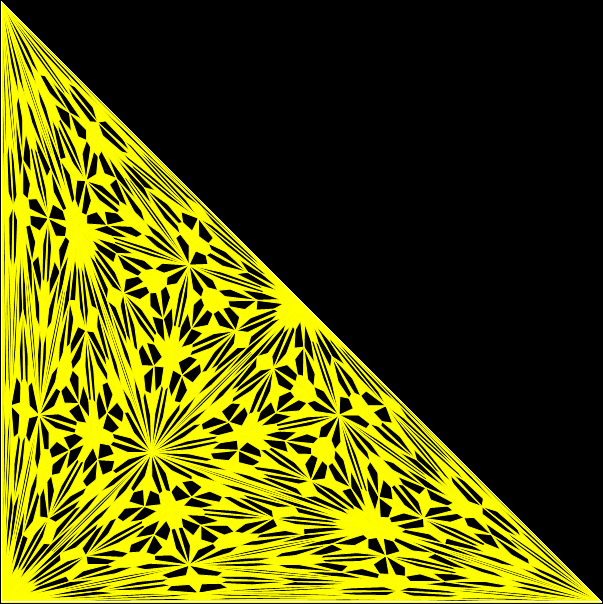 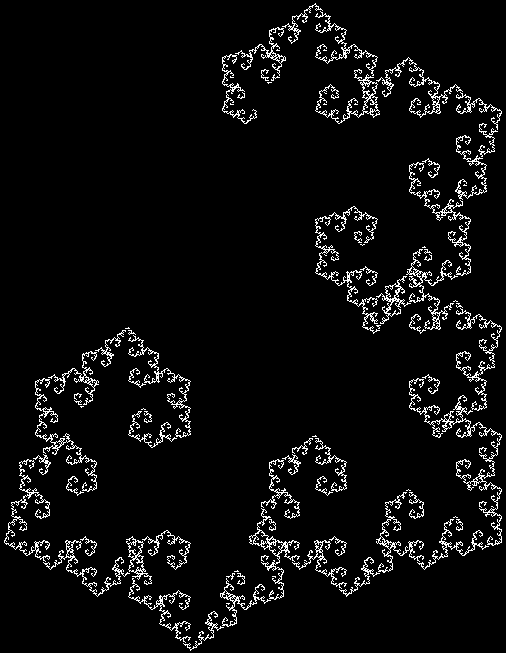 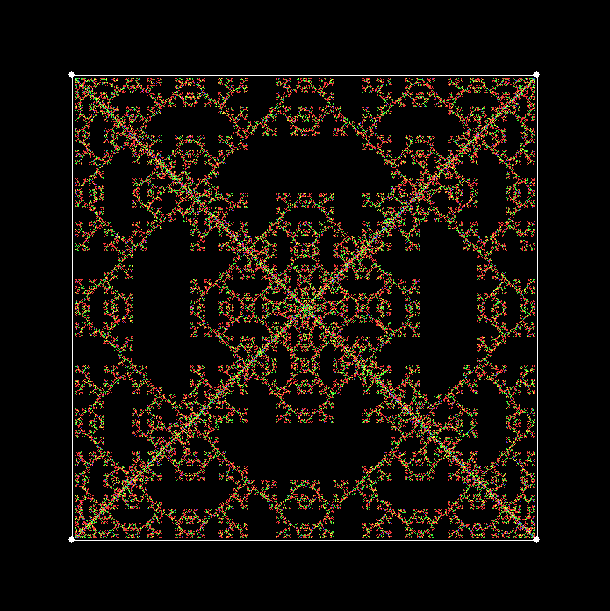 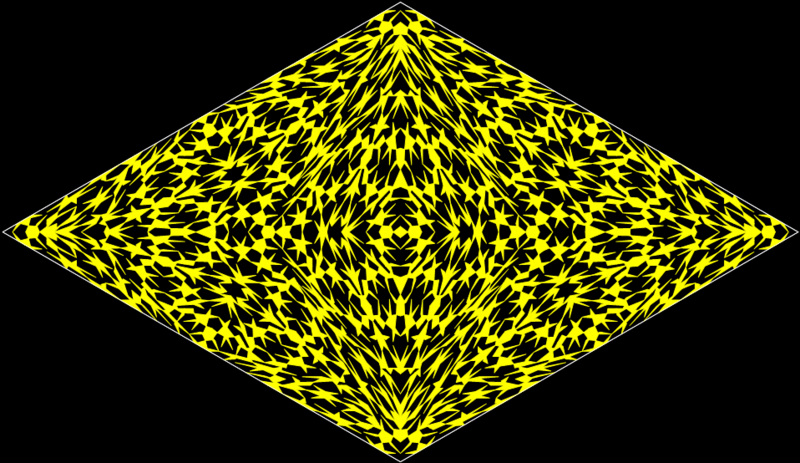 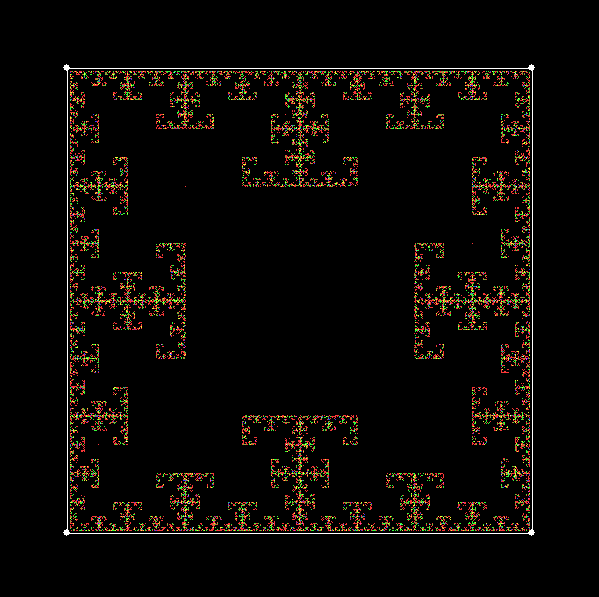 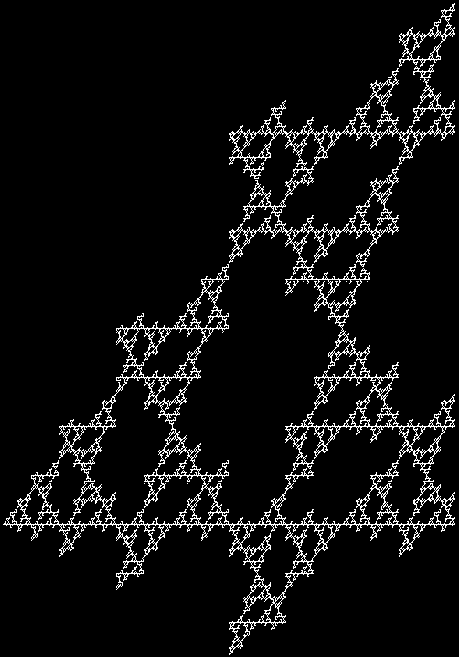 The same fractals appear, because apparently different algorithms are actually the same underneath. 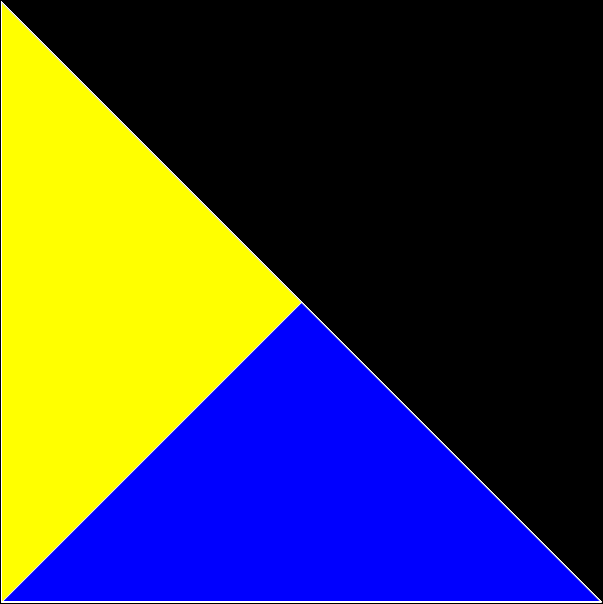 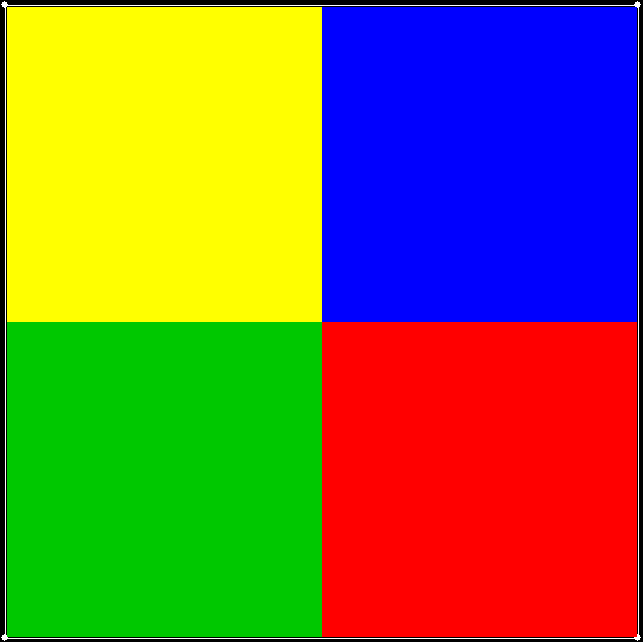 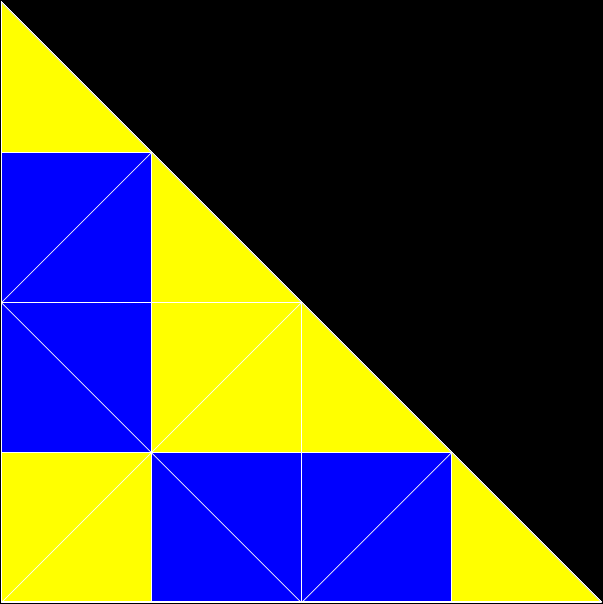 Note that when pixels are used again, the colour changes. 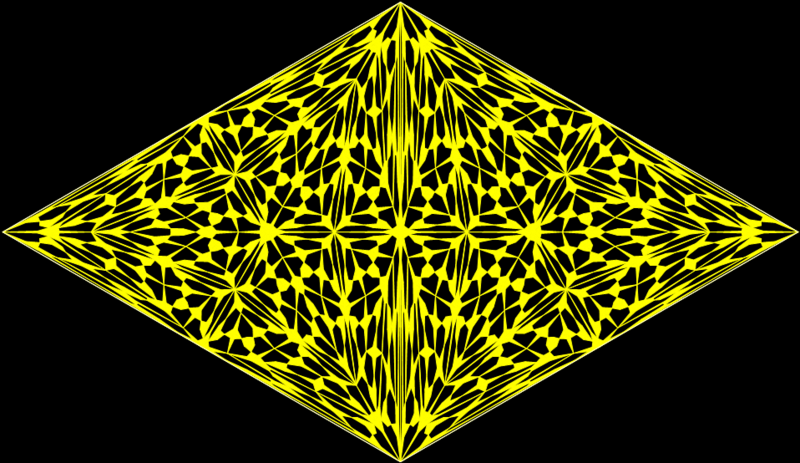 That’s another interesting thing about maths: limits can sometimes produce deeper results. 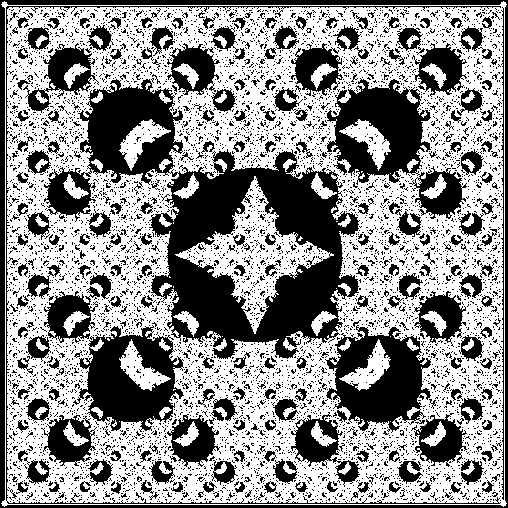 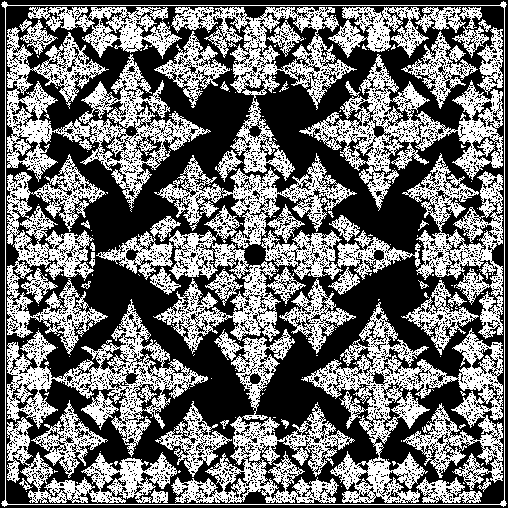 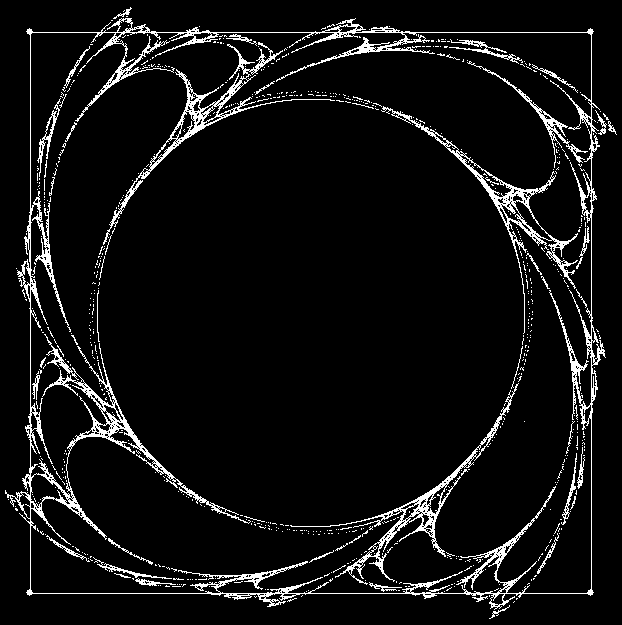 If these fractals were drawn at very high resolution, pixels would only be used once and the colour would never change. 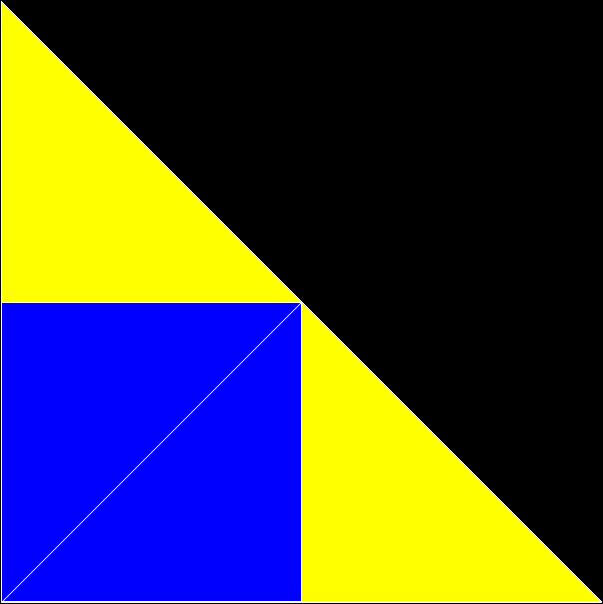 As it is, low resolution means that pixels are used again and again. 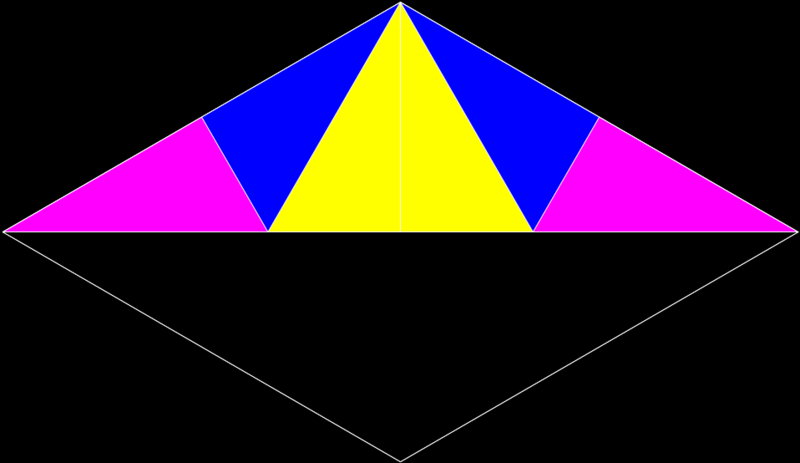 But some are used more than others, which is why interesting colour effects appear. 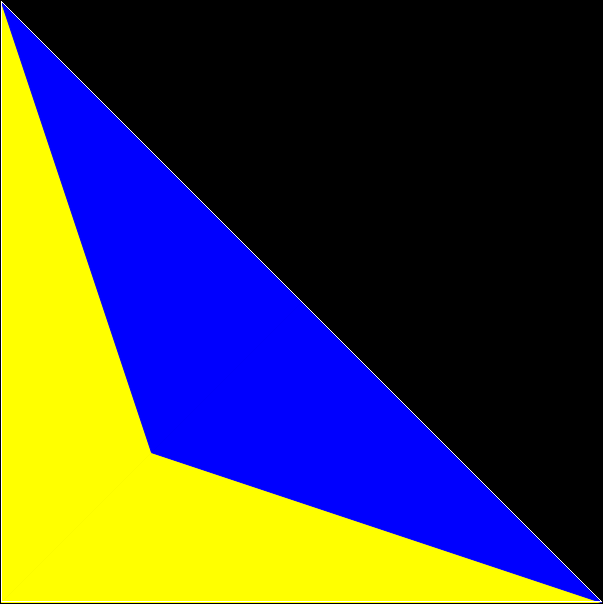 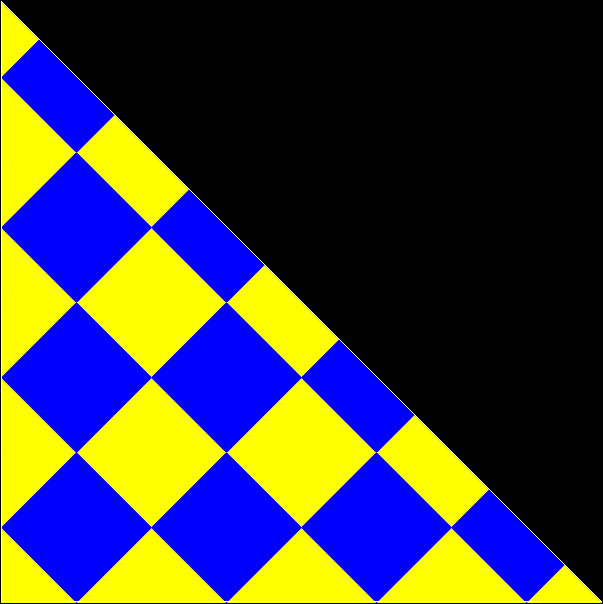 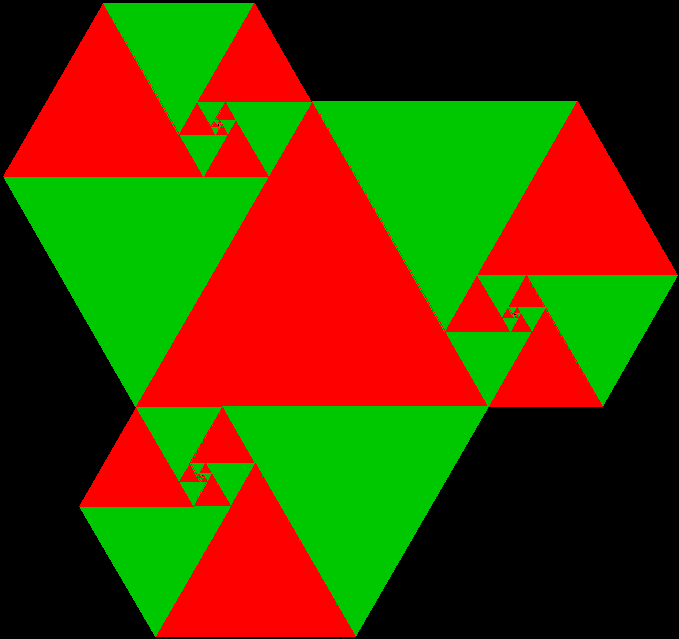 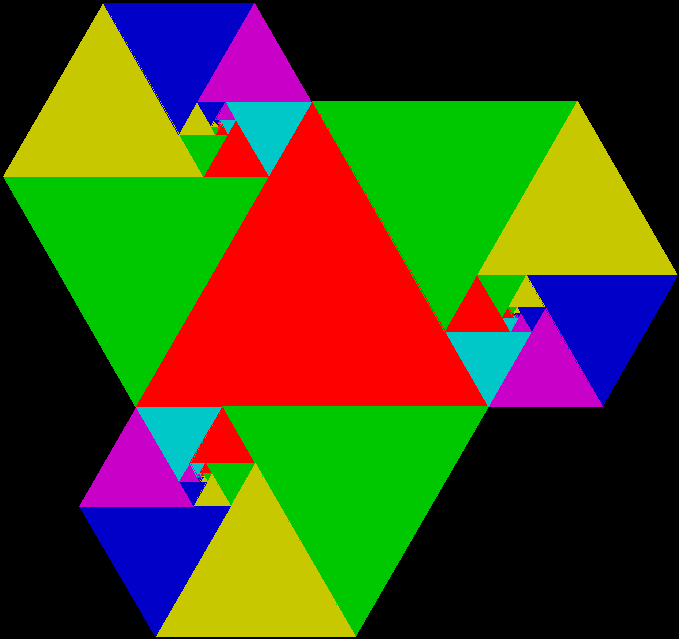 As I’ve explained before on Overlord of the Über-Feral, the planet’s premier purveyor of polygonic performativity (probably (possibly (perspectivistically))), it works with triangles and pentagons, but not with squares. 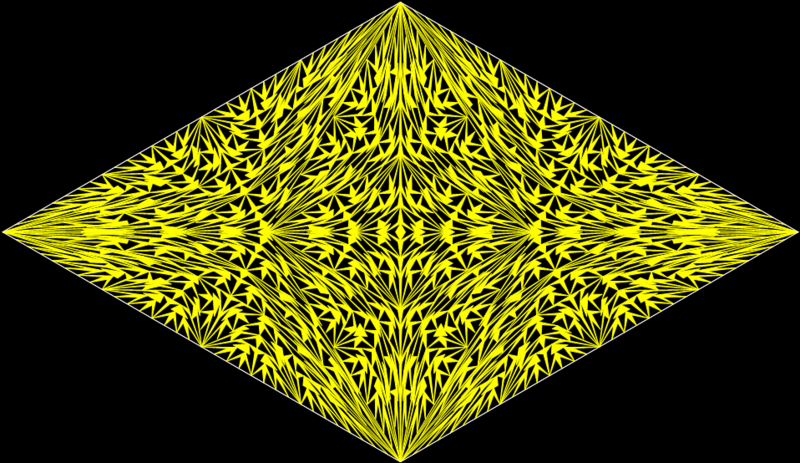 And what is “it”? 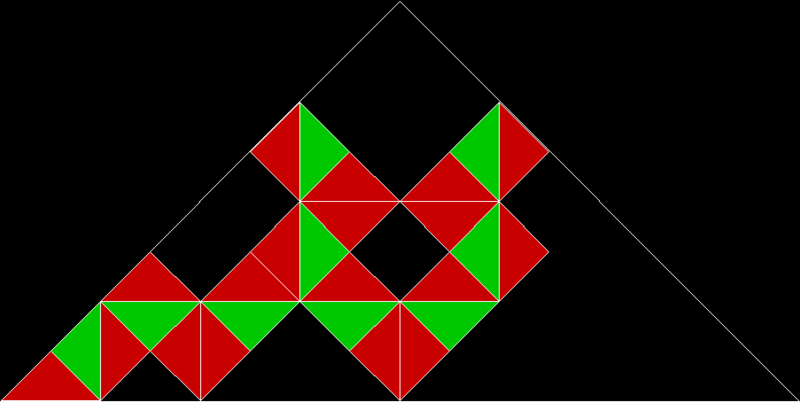 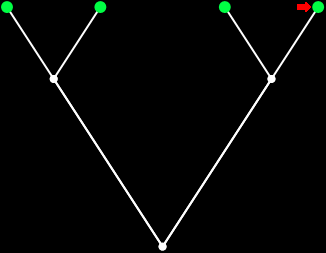 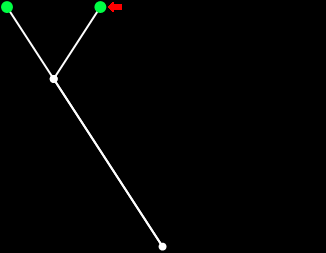 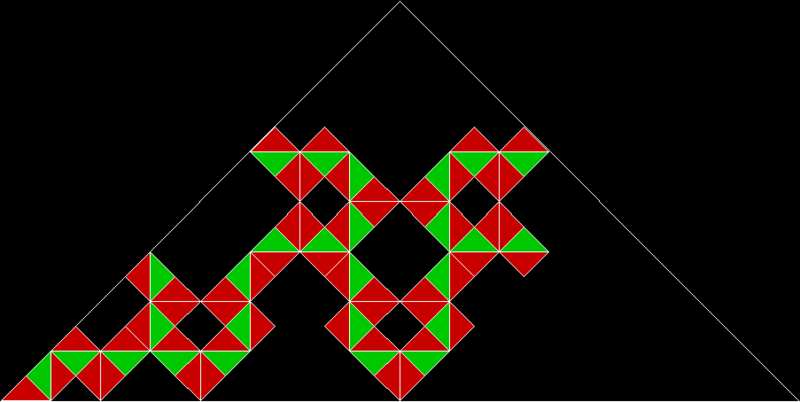 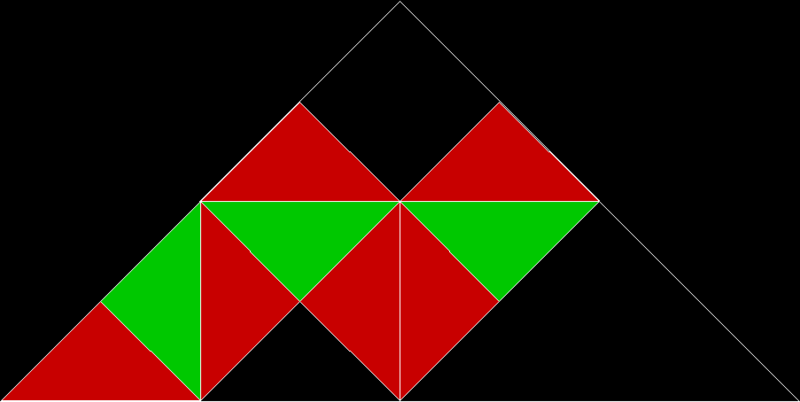 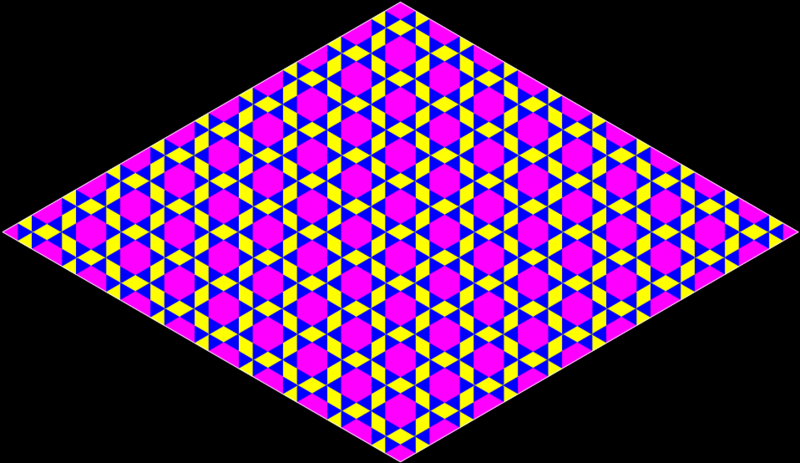 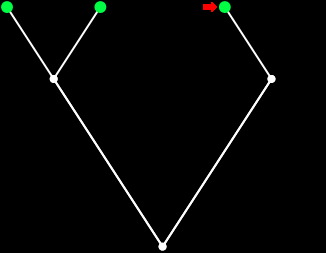 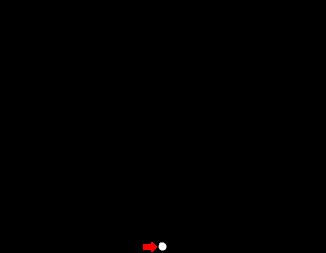 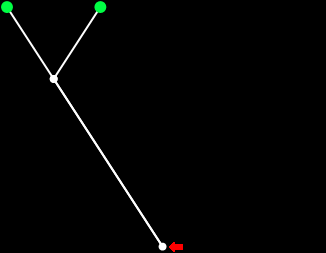 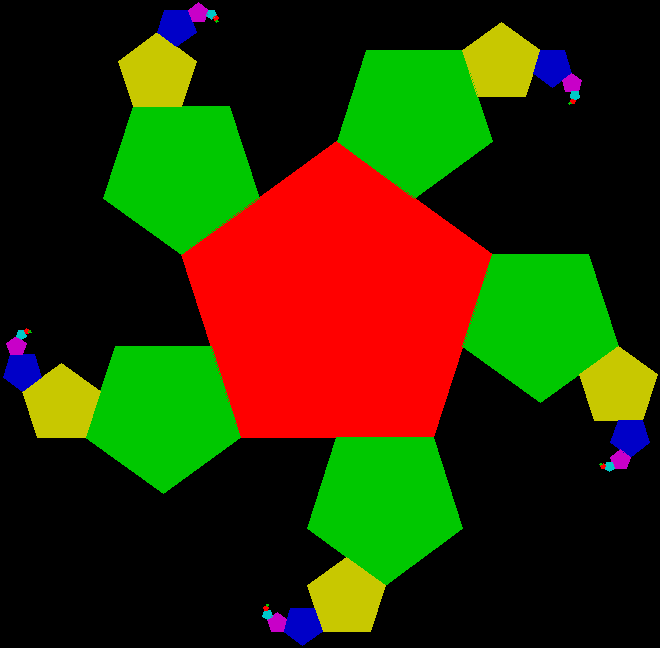 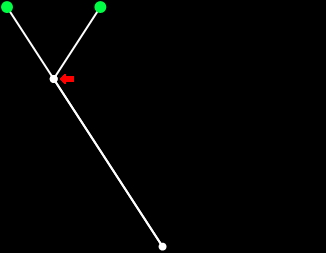  A simple procedure in which you create a polygon, choose a point inside it, then repeatedly move half-way towards a vertex chosen at random, marking each new position as you go. 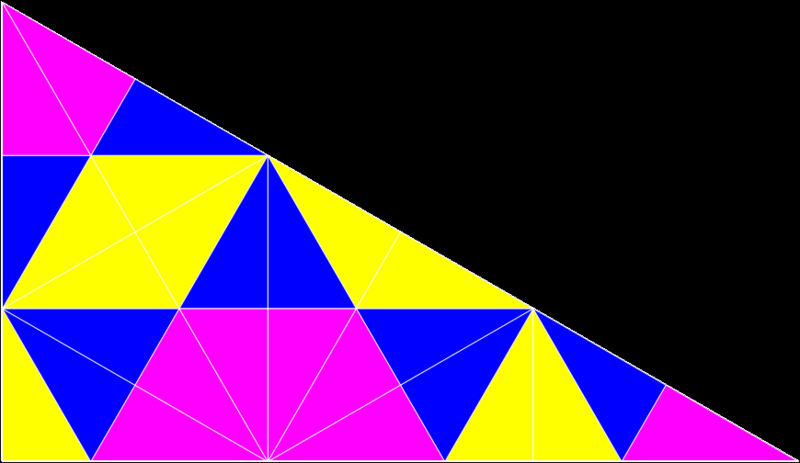 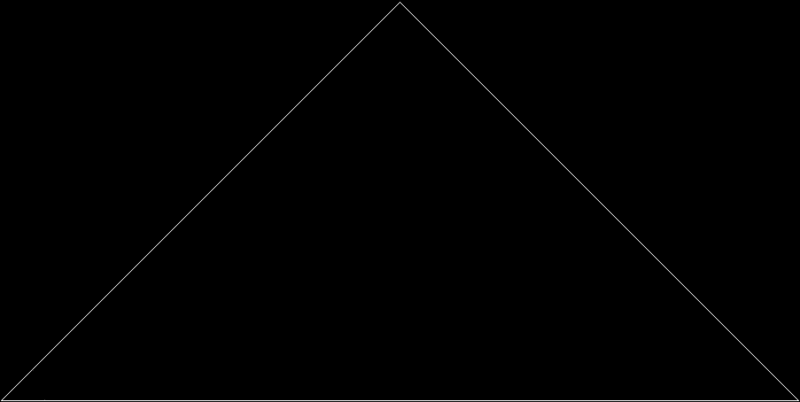 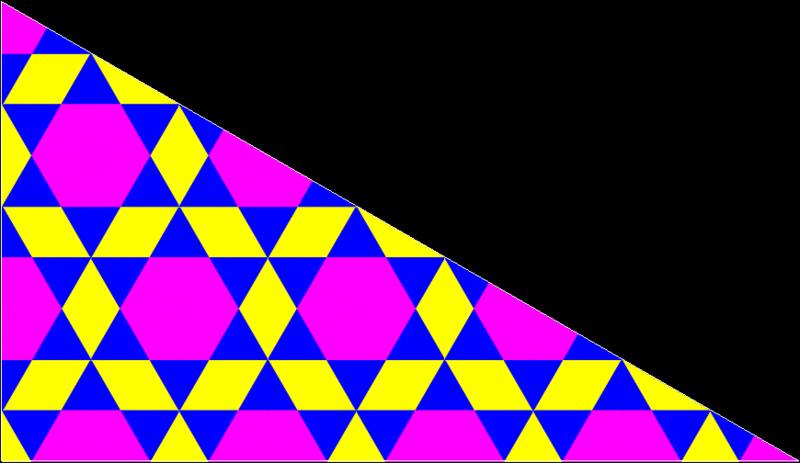 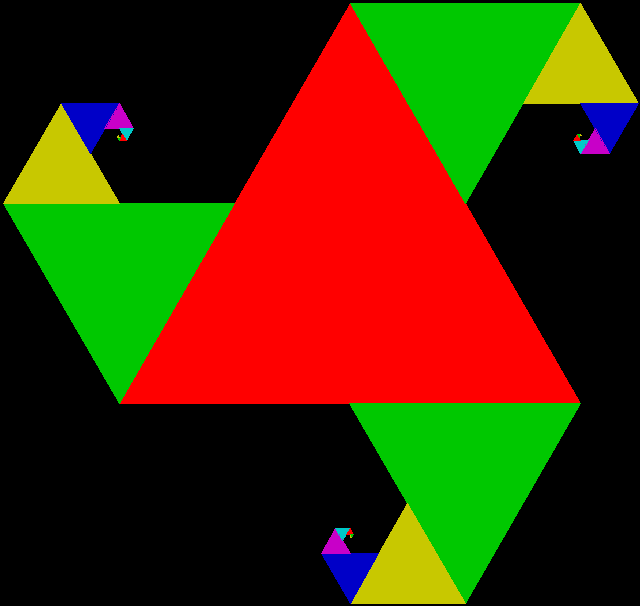 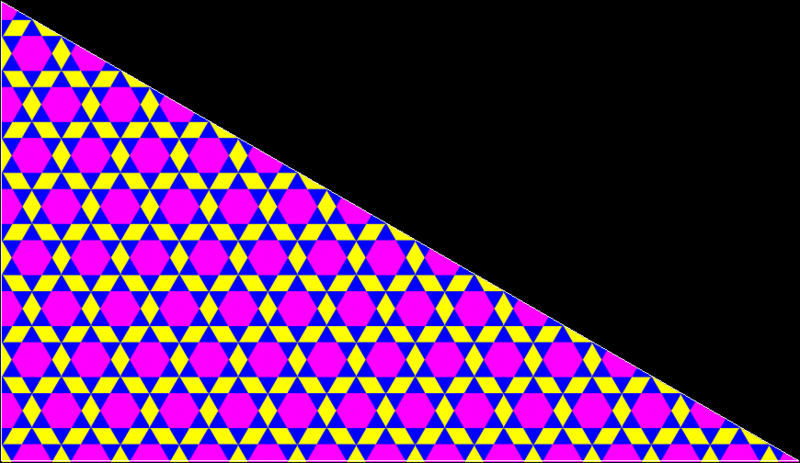 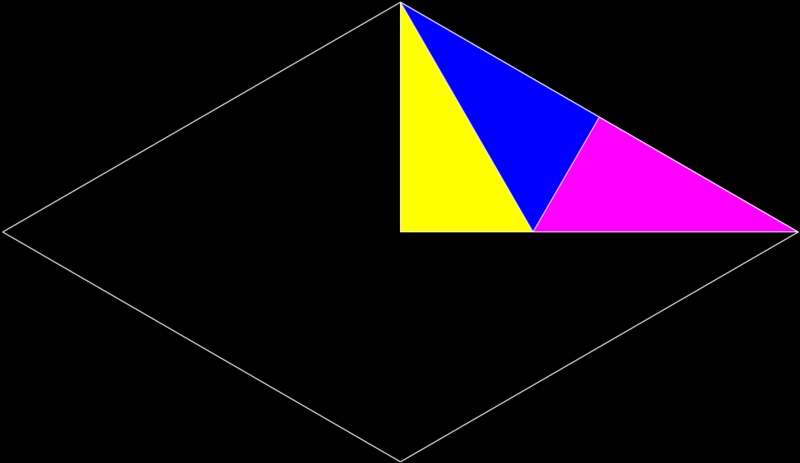 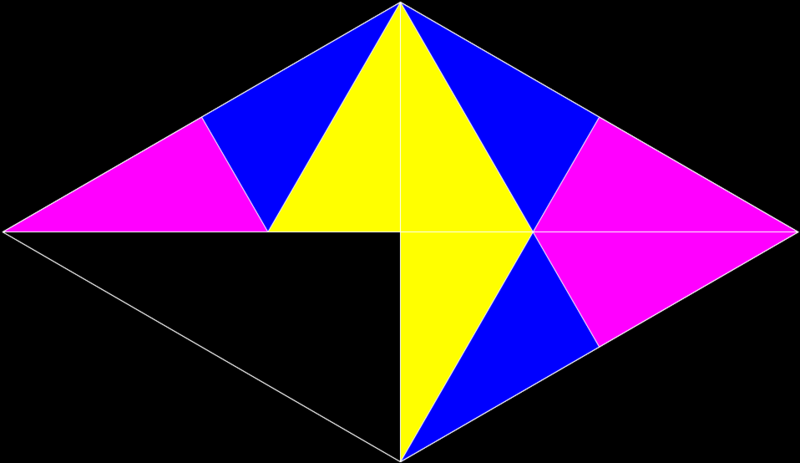 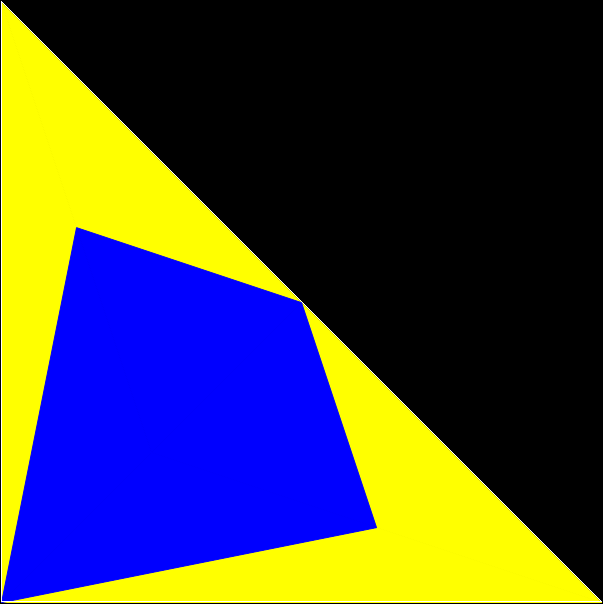 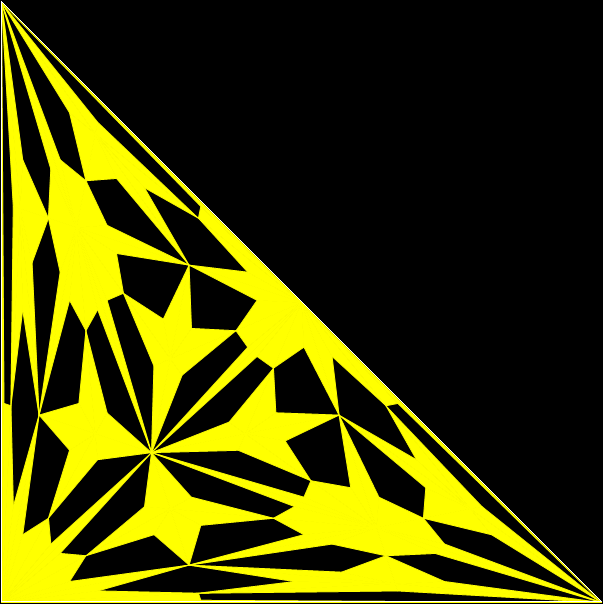 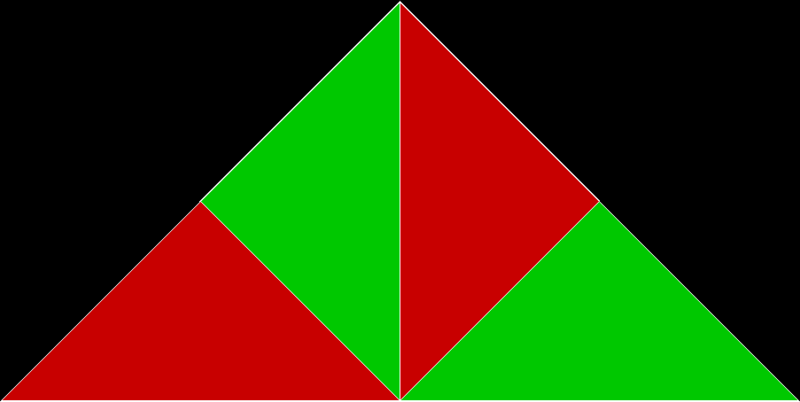 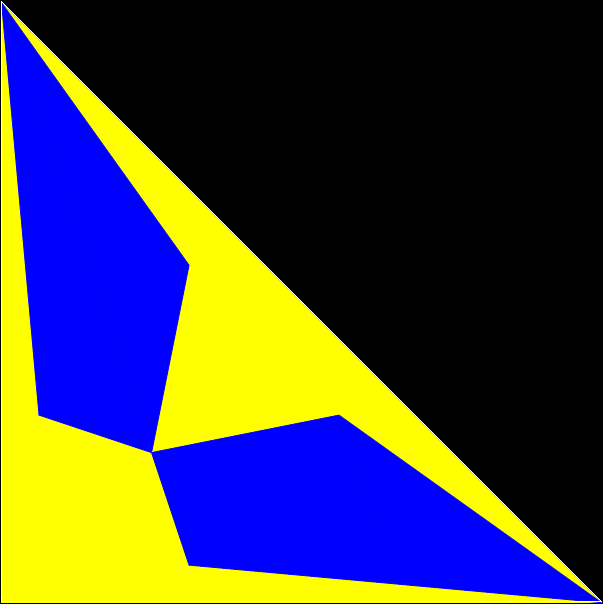 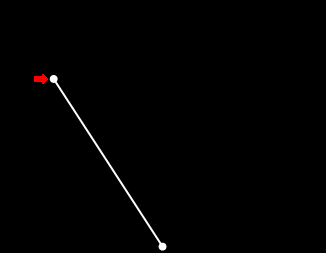 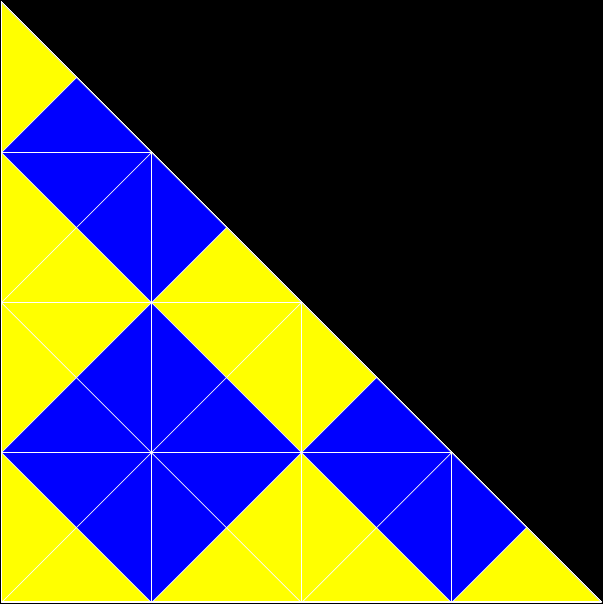 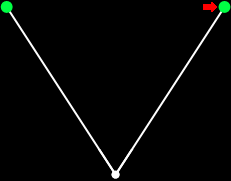 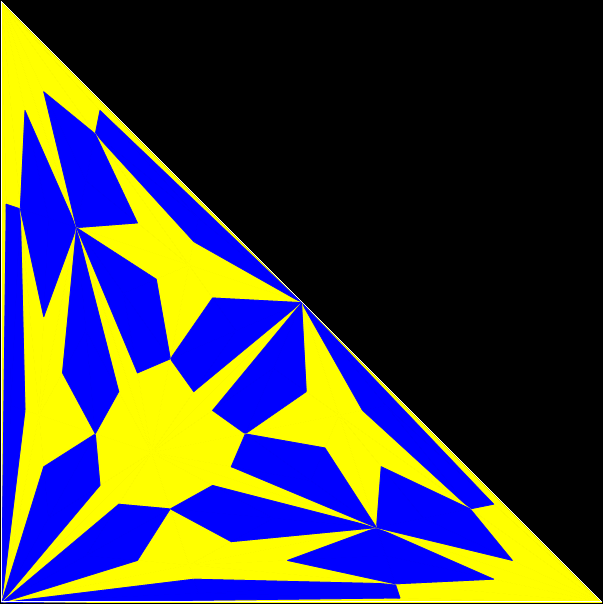 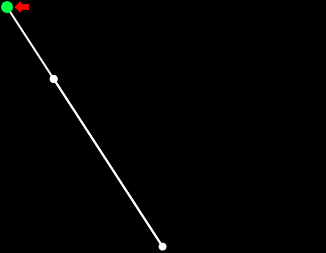 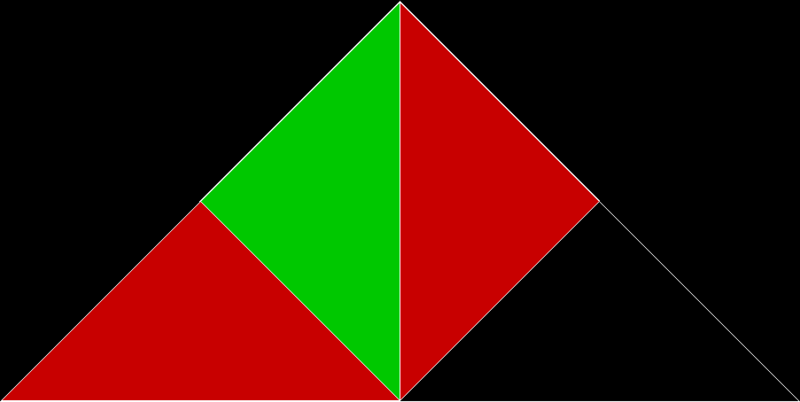 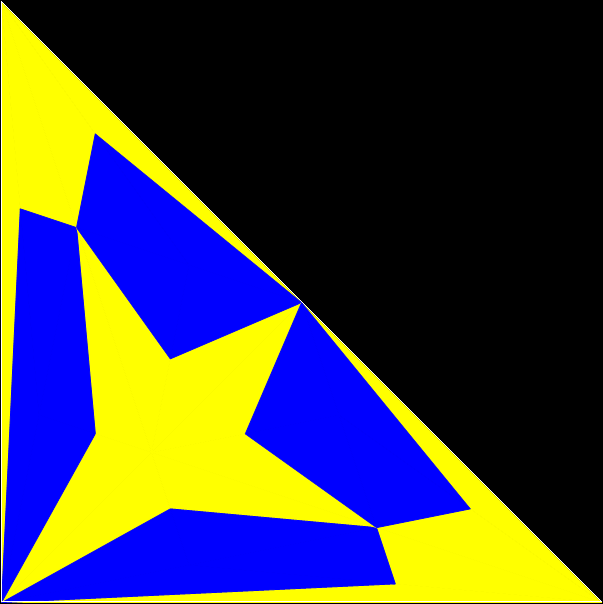 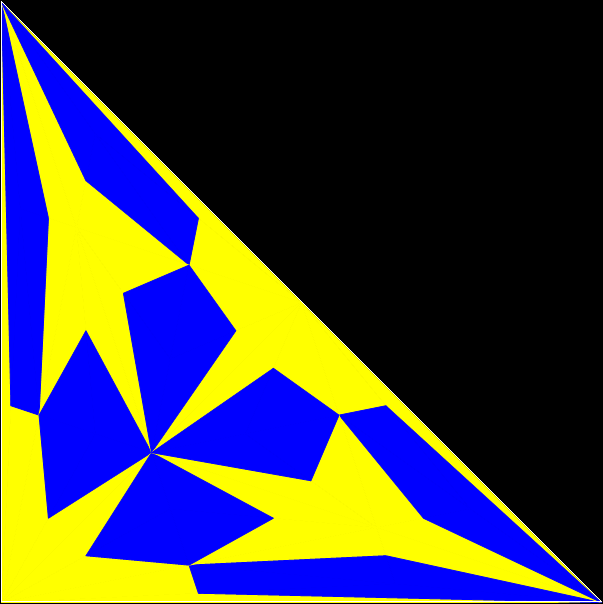 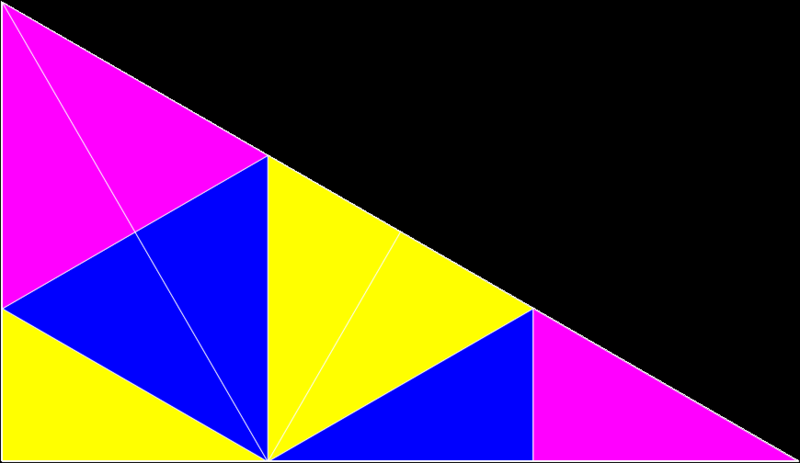 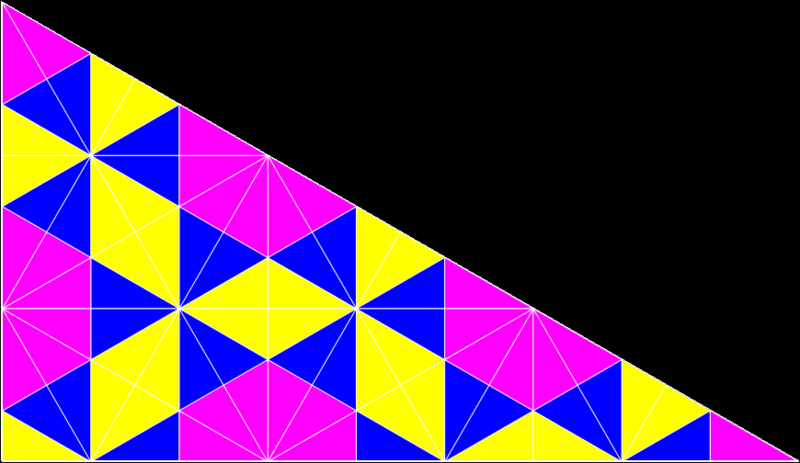 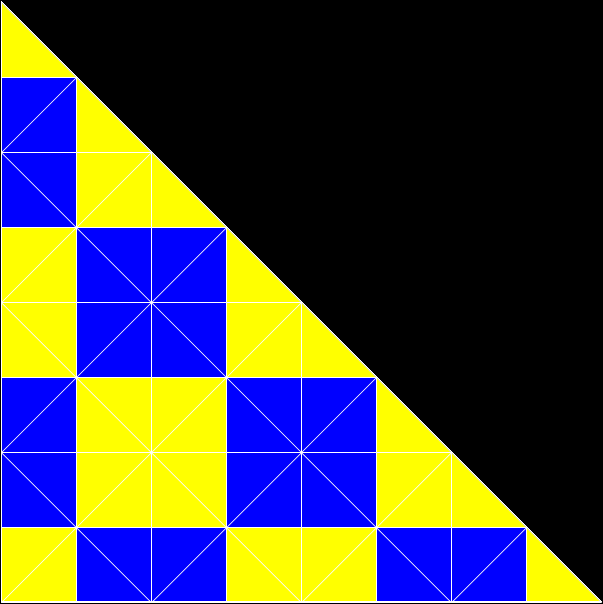 When the polygon has three vertices, you get a Sierpiński triangle. 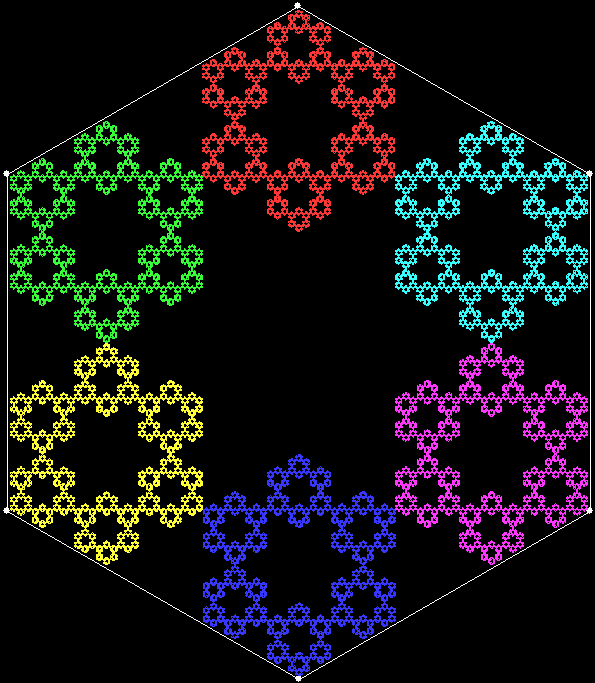 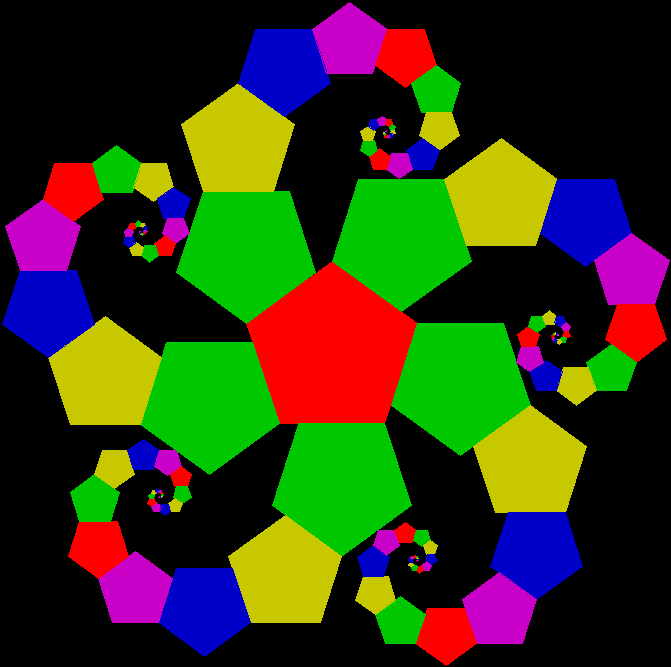 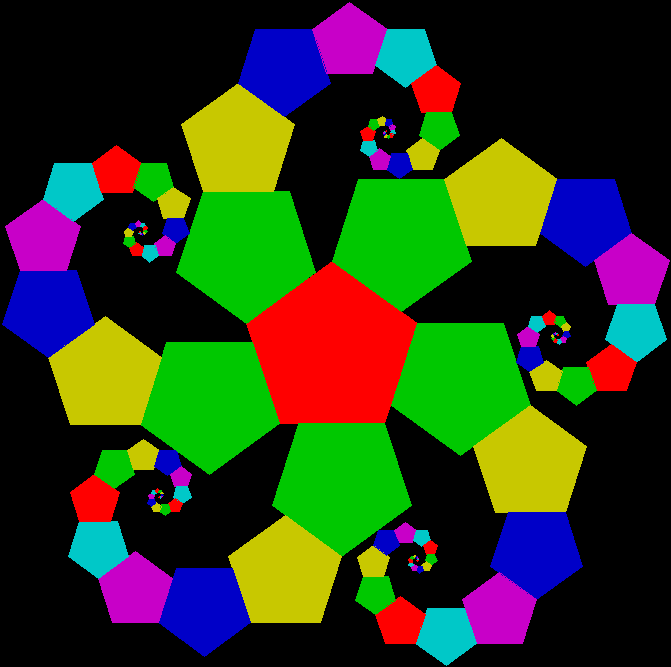 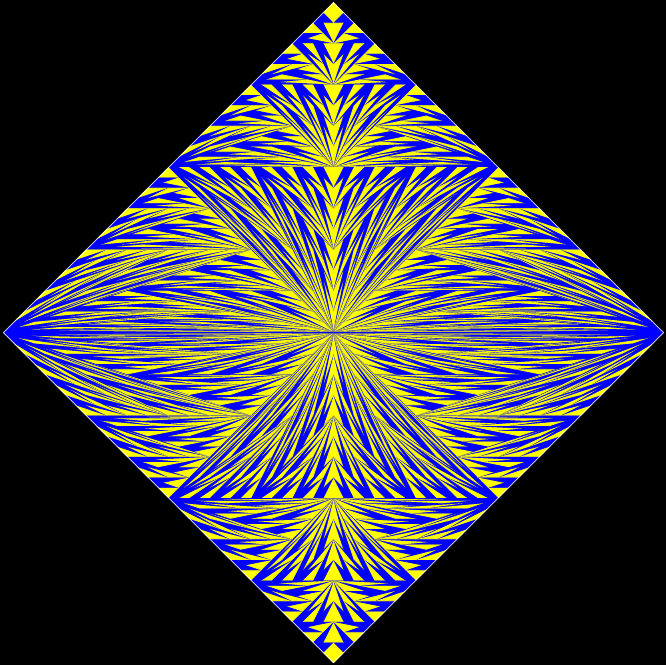 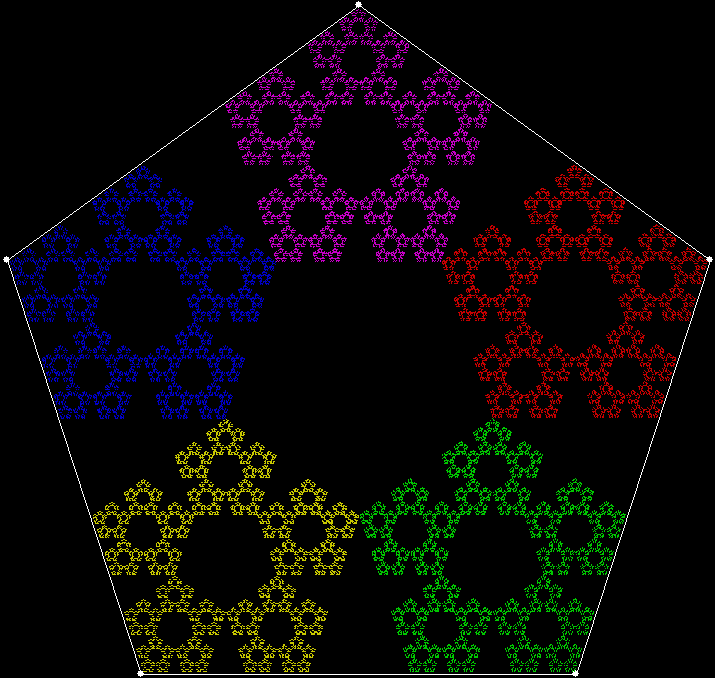 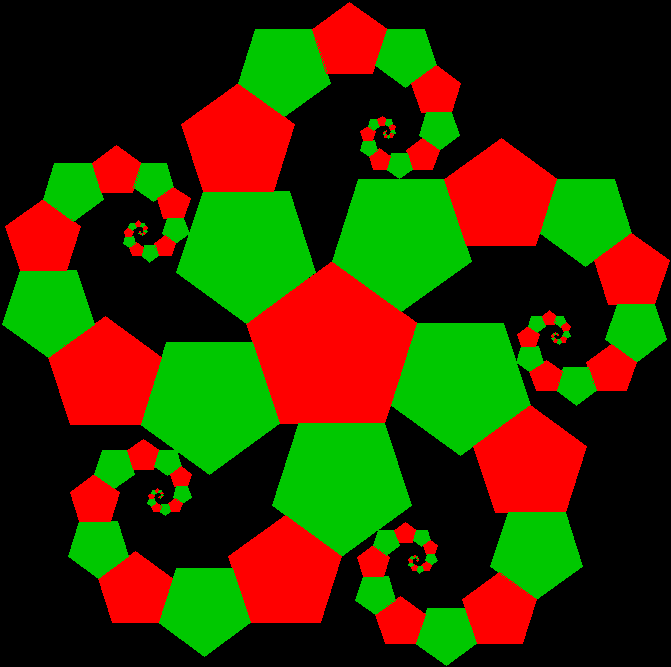 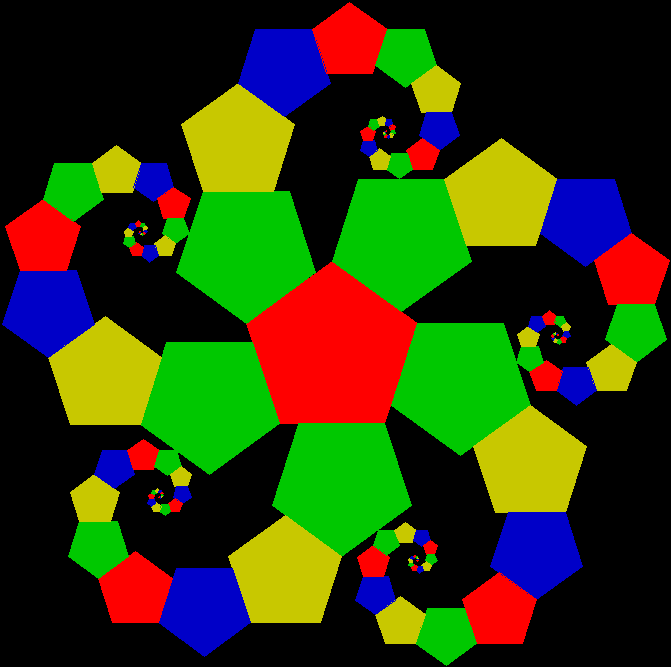 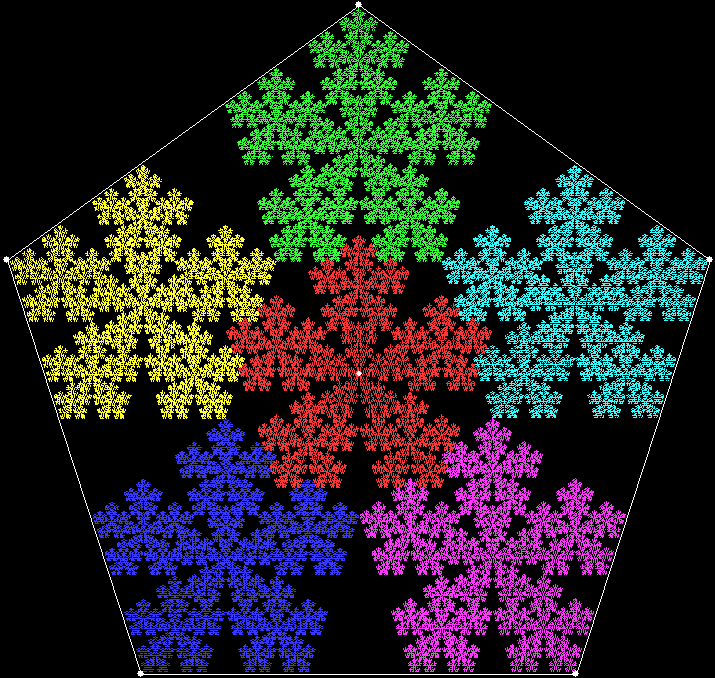 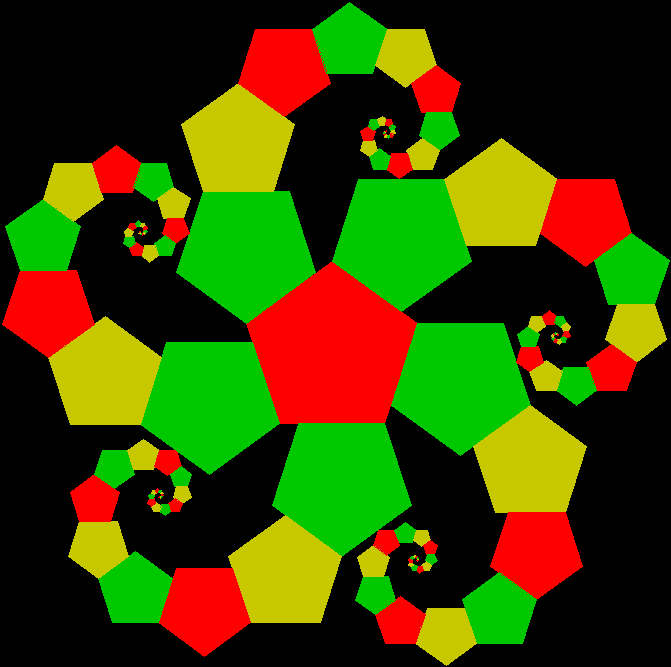 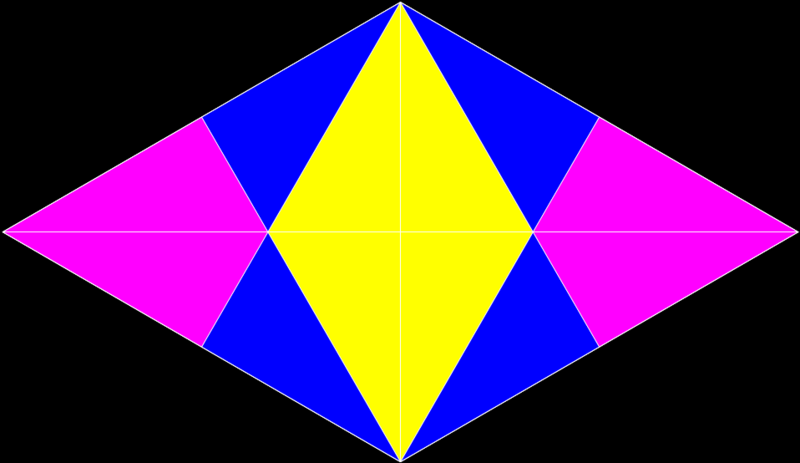 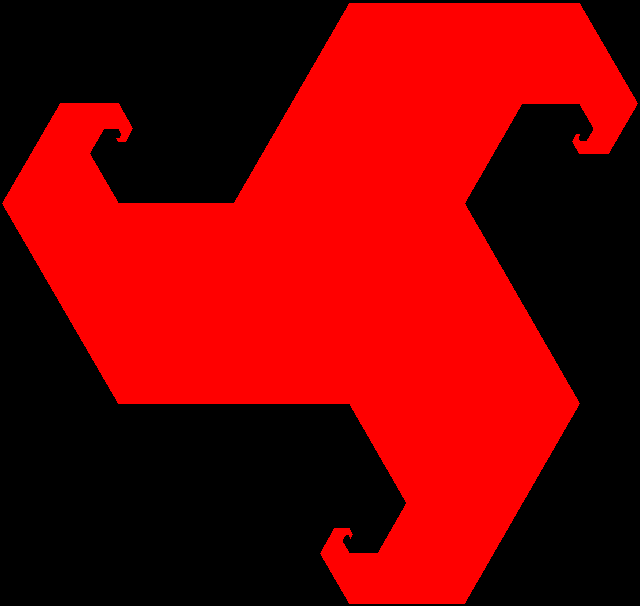 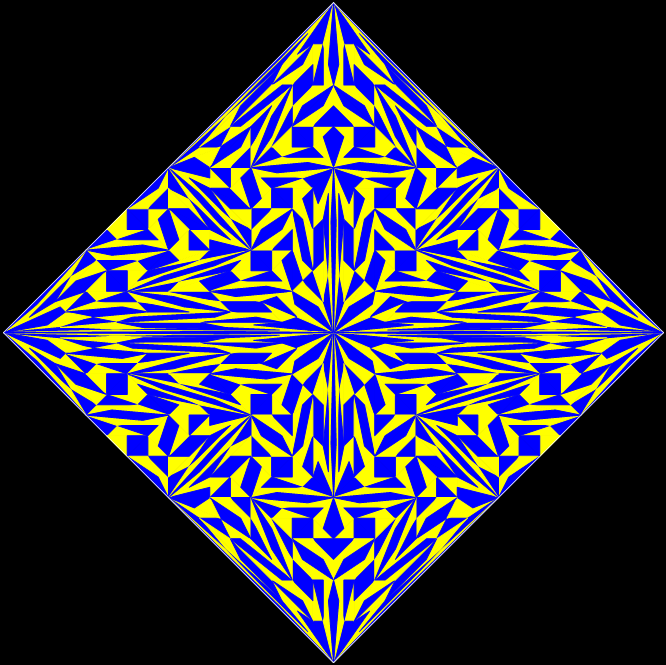 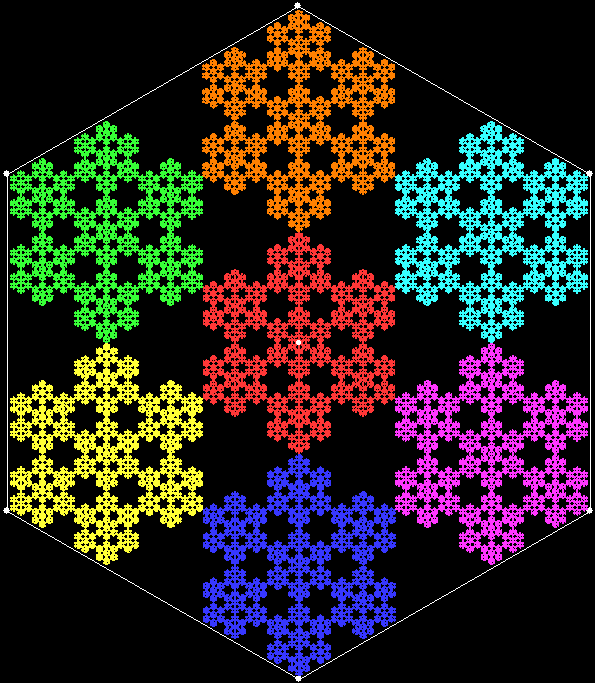 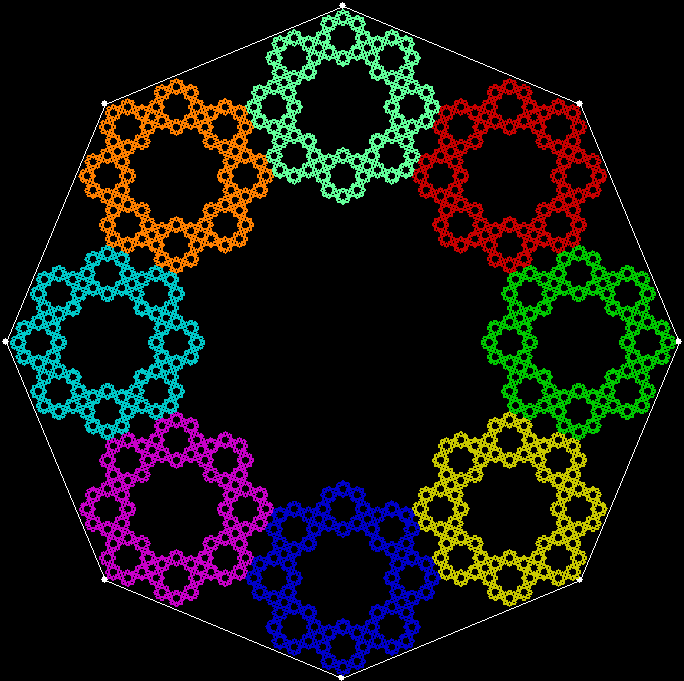 When it has five, you get what might be called a Sierpiński pentagon. 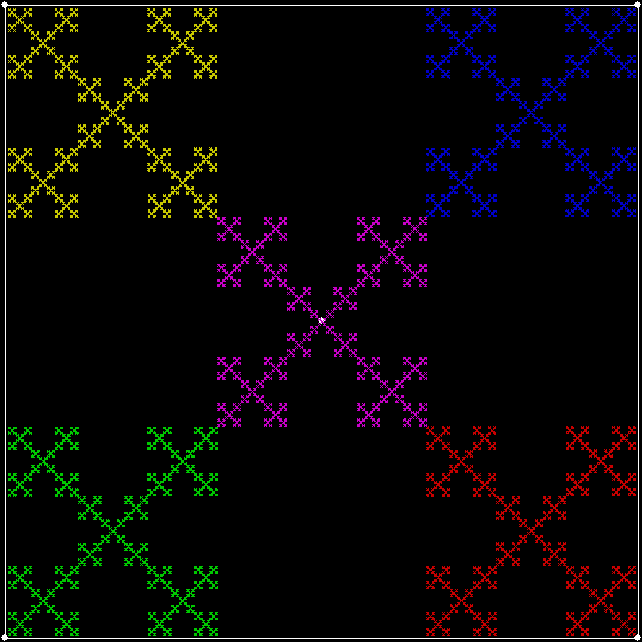 When it has four, you get nothing. Or rather: you get everything, because the whole interior of the square gradually fills with points. 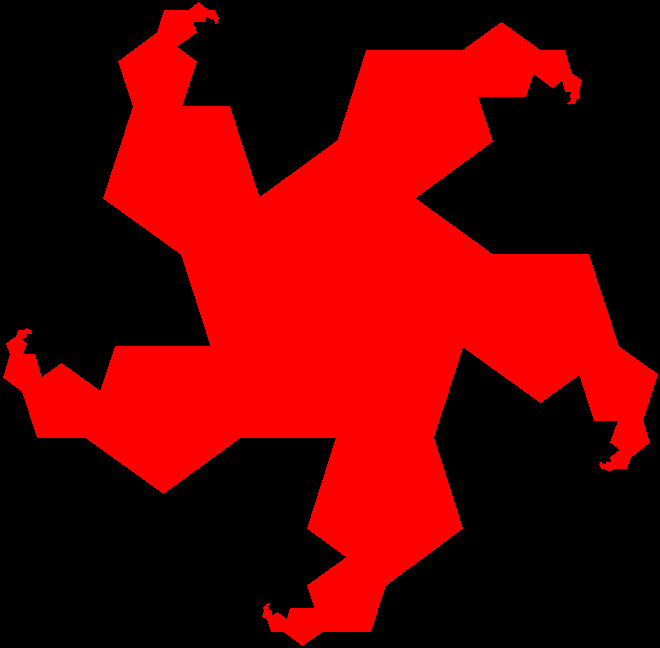 But, as I’ve also explained before, there’s a simple way to change this. 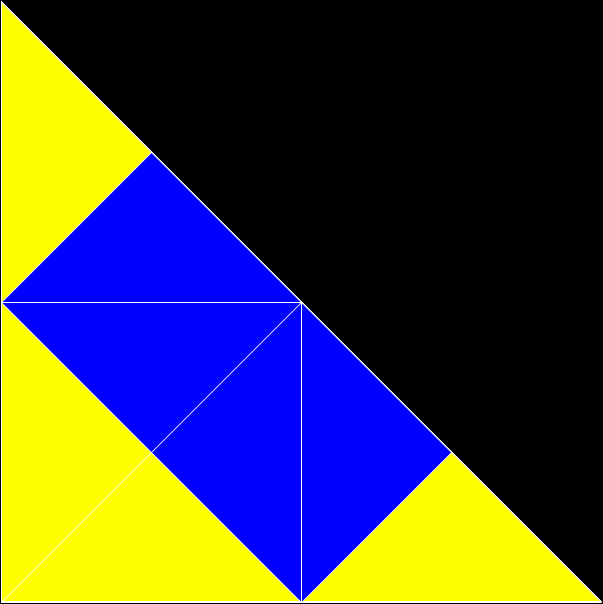 You can adapt the procedure so that a vertex can’t be chosen twice in a row, and so on. 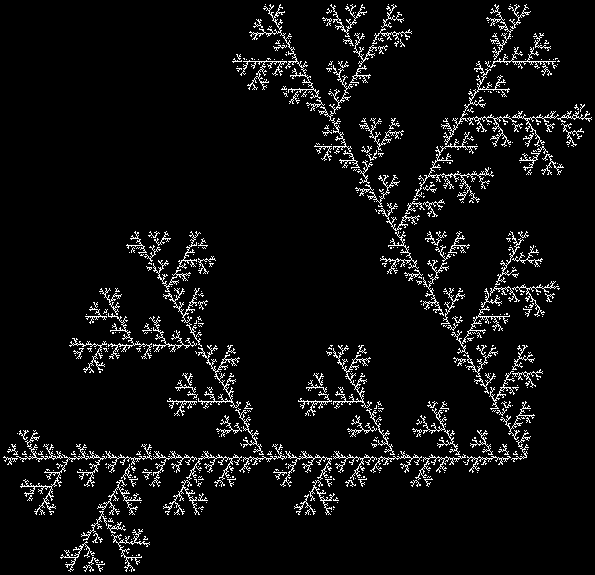 Fingers are fractal. 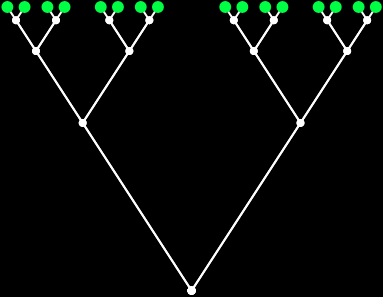 Where a tree has a trunk, branches and twigs, a human being has a torso, arms and fingers. 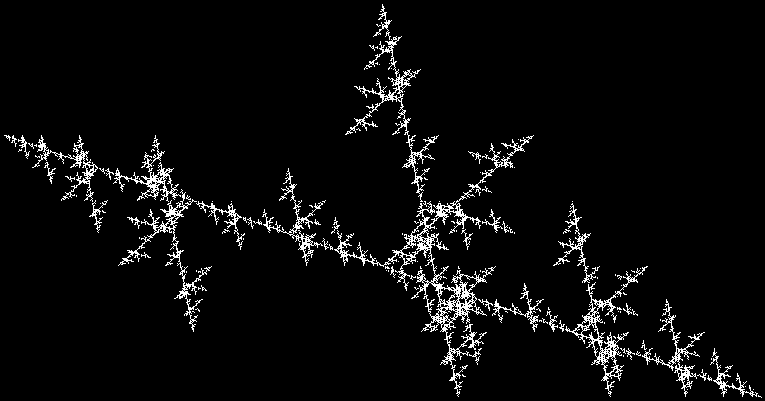 And human beings move in fractal ways. 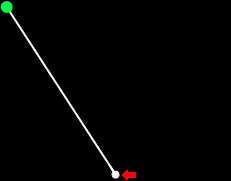 We use our legs to move large distances, then reach out with our arms over smaller distances, then move our fingers over smaller distances still. 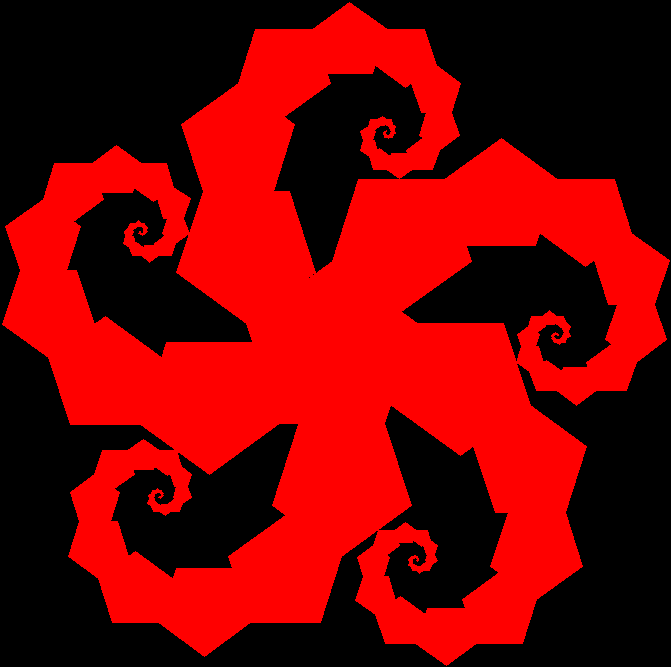 We’re fractal beings, inside and out, brains and blood-vessels, fingers and toes. 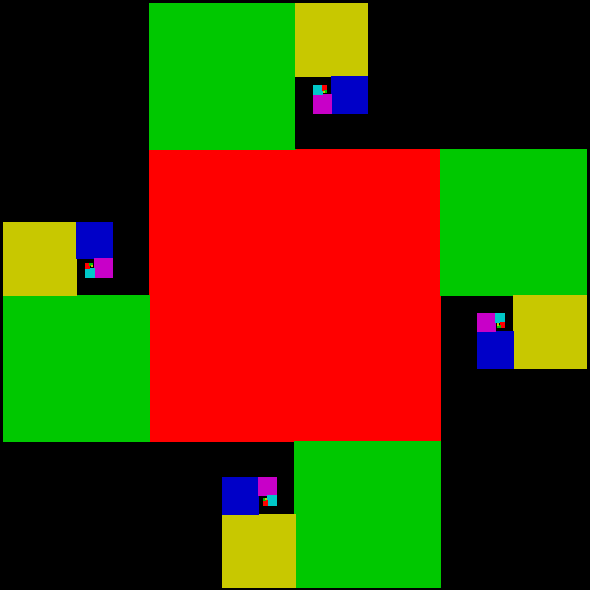 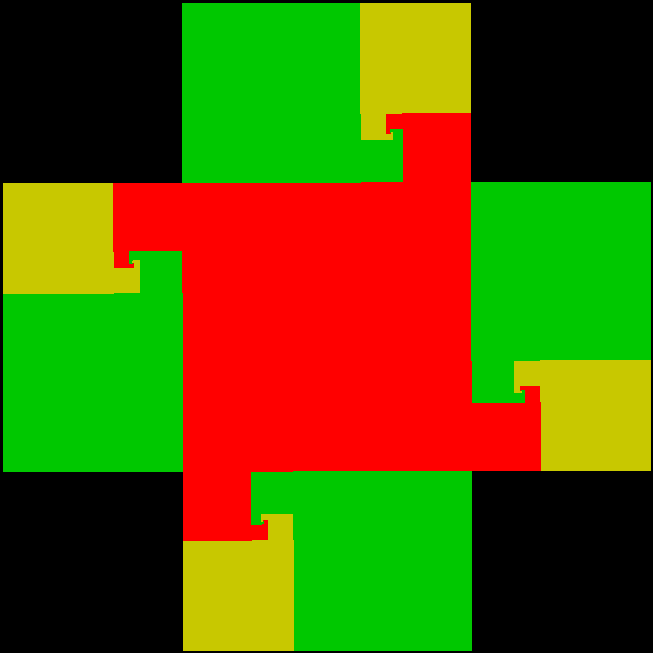 Move between the five points of the square by stepping through the individual digits of the numbers in the sequence. 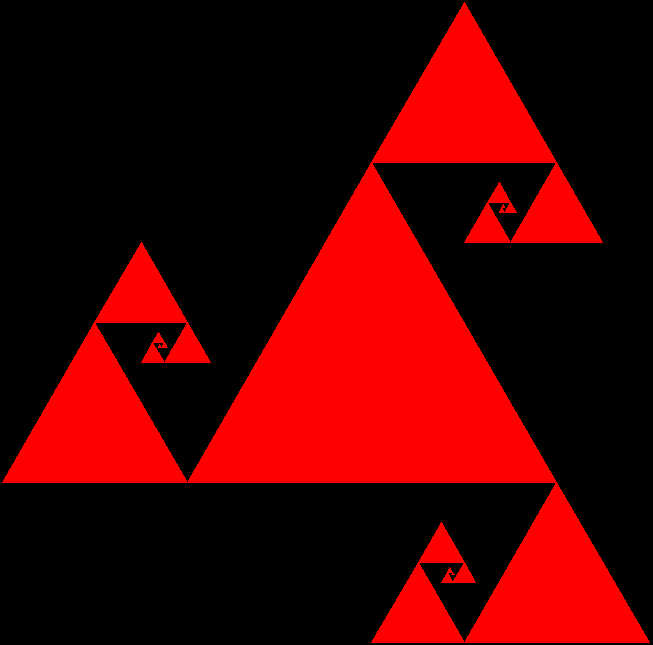 For example, if the number is 2451, the first set of successive digits is (2, 4), so you move to a point half-way between point 2 and point 4. 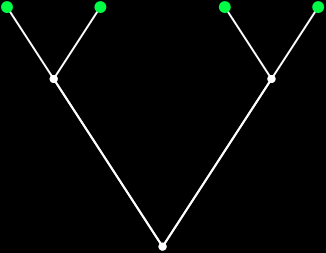 Next come the successive digits (4, 5), so you move to a point half-way between point 4 and point 5. 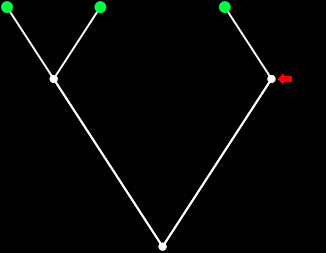 Then come (5, 1), so you move to a point half-way between point 5 and point 1.